In the beginning, there was the Genesis. Following that was the Genesis LE and the lighter Nemesis racing platform. 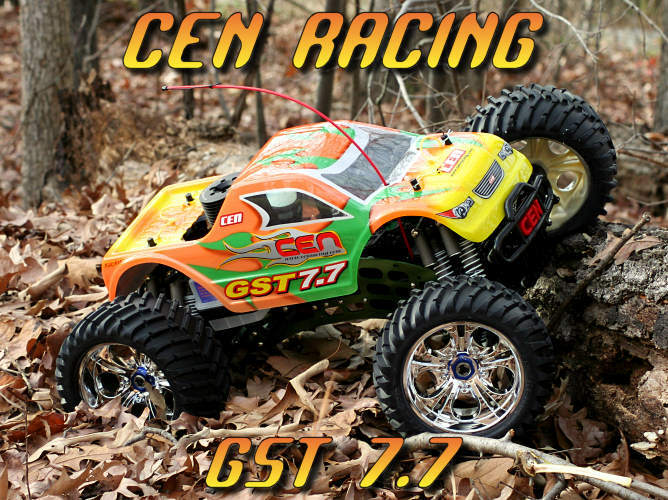 Now a new chapter is upon us with CEN’s flagship monster truck, the GST 7.7. While the basic layout of the truck is the same as before, CEN hasn’t stood still. They’ve been reworking areas of the truck to offer better reliability and ease of use to provide the owner an even better experience. The Genesis has always stood at the top of the list when it comes to a big bruiser of a truck. With a length of just over 23 inches and a weight of around 17 pounds, it’s definitely targeted towards the crowd who wants their truck to dwarf the competition. With that market covered though, CEN has reworked the motor in the GST 7.7 to give the owner more power as well as an easier to tune truck. When that’s rolled in with the new green anodizing and paint scheme, it’s easy to make the assumption that this will be the best version of the truck yet. The .46 cubic inch motor in this brute has always provided a great deal of stump pulling torque, making this truck ideal for backyard bashers across the country. So I’m curious as to how well the new GST 7.7 will respond with its revisions and changes. 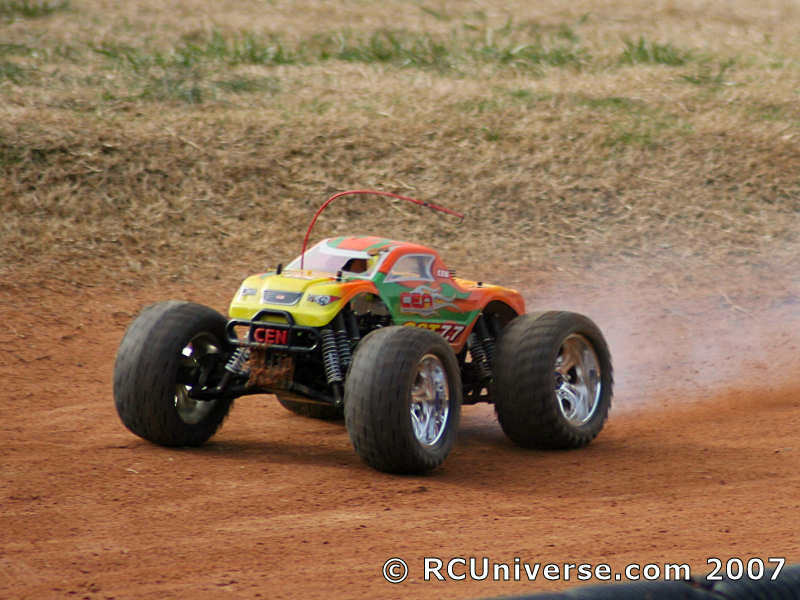 Hang on, it’s time to go bashing with the biggest 1/8 scale monster truck of them all! 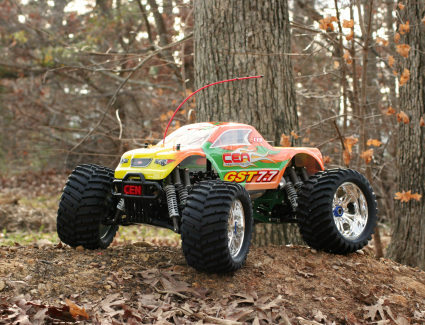 From the moment I saw the prototype for the CEN GST 7.7 I hoped they would pull off the body they had been posing it with. The original prototype design was custom airbrushed and looked simply fantastic. 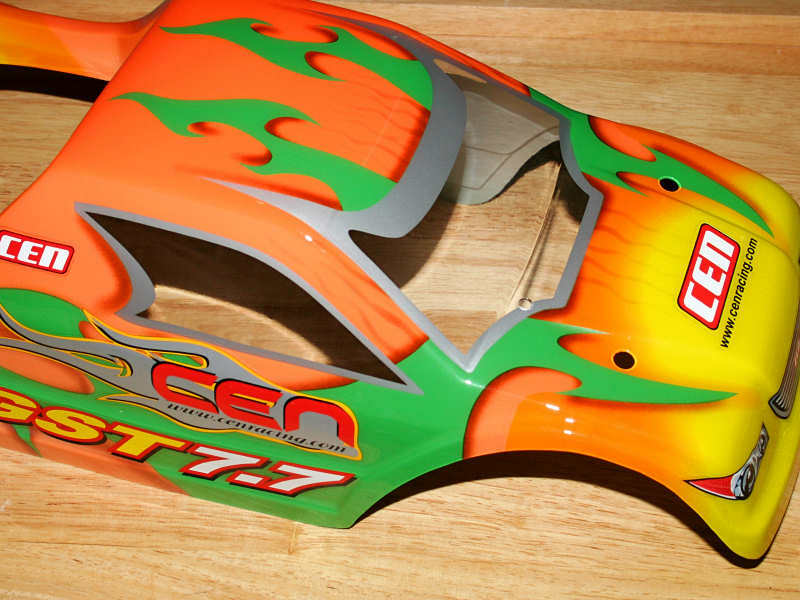 While a screen printed body would have a tough time faithfully reproducing the intricate details of the design, CEN did an excellent job of taking that layout and working it into a fresh brightly colored lid for the newest incarnation of the Genesis platform. 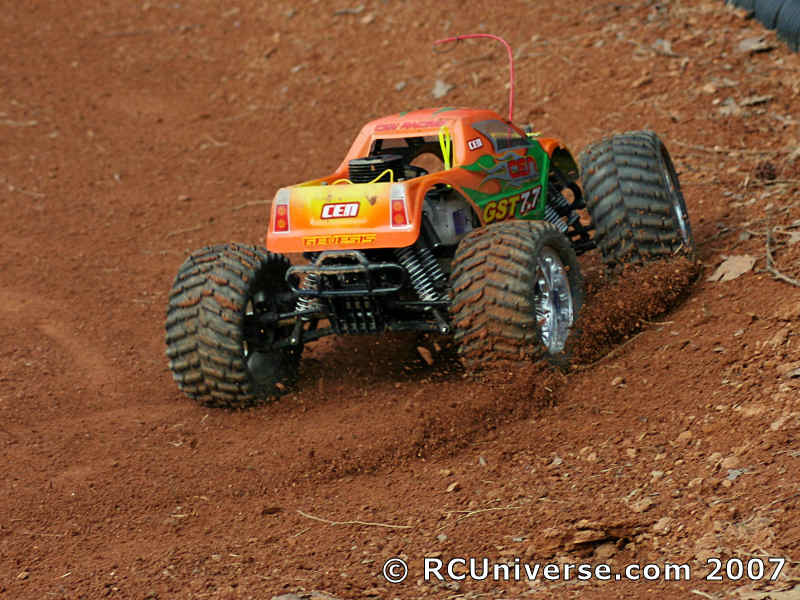 It’s their best body yet, and simply one of the better looking RTR monster truck bodies out there! 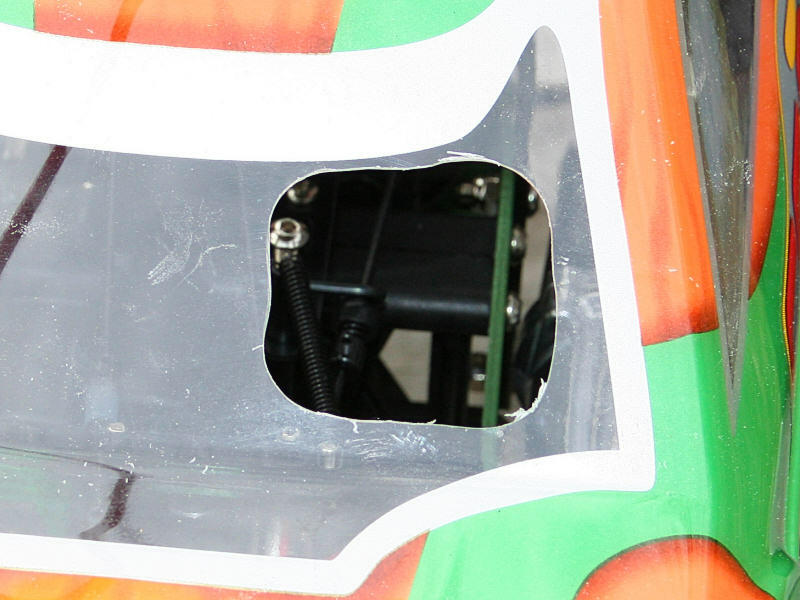 The back of the body is opened up to allow easy access for the fuel tank and engine. CEN has also made the body post holes and applied the stickers for you as well. My only complaint is that the hole for the antenna is too small. While the tube alone will fit through it, the tube with the cap installed will not. So you’ll probably want to enlarge the antenna hole. 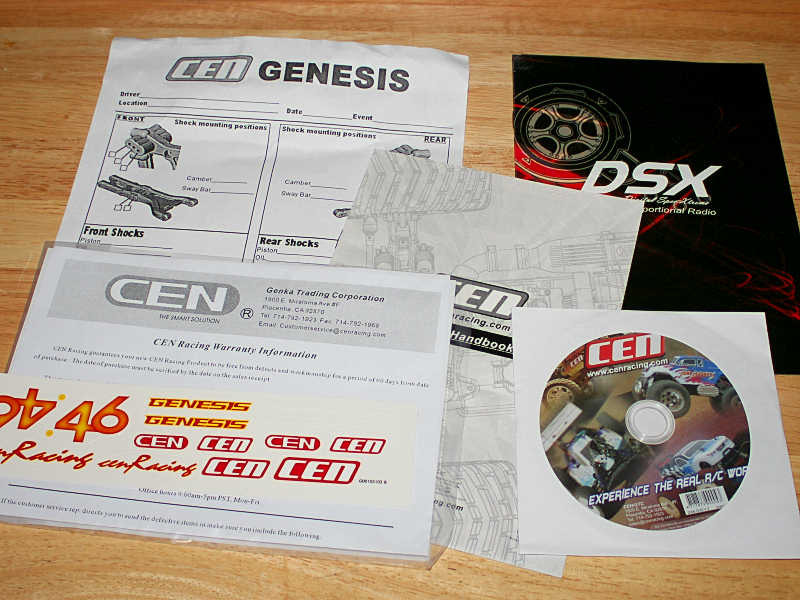 CEN Racing has had a habit of serving their customers well with color documentation and exploded diagrams. The included owner’s manual should cover all of the vehicle basics you’ll need to know, as well as giving you all of the assembly information you need to service and maintain the GST 7.7. 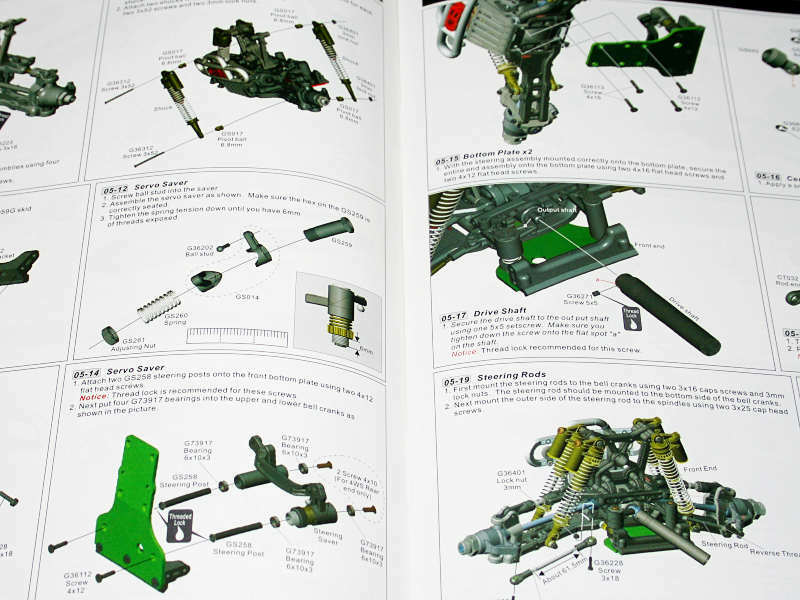 When it comes to their owner’s manual, CEN certainly deserves a pat on the back! CEN throws in a few other informative related items as well. Separate manuals cover the basics for the engine and radio, as well as a separate setup sheet to help get you started recording your favorite suspension configuration. 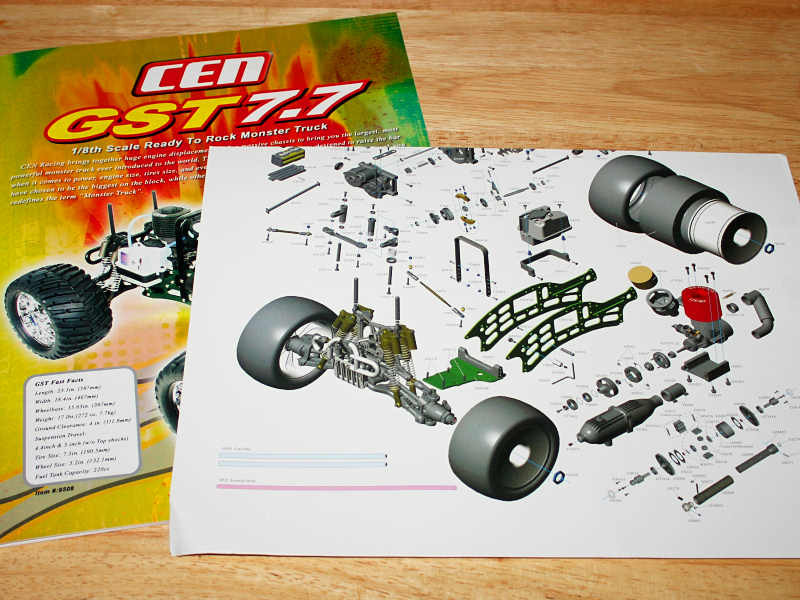 CEN throws in a sheet with a few extra stickers, and a DVD that showcases other vehicles in their lineup. 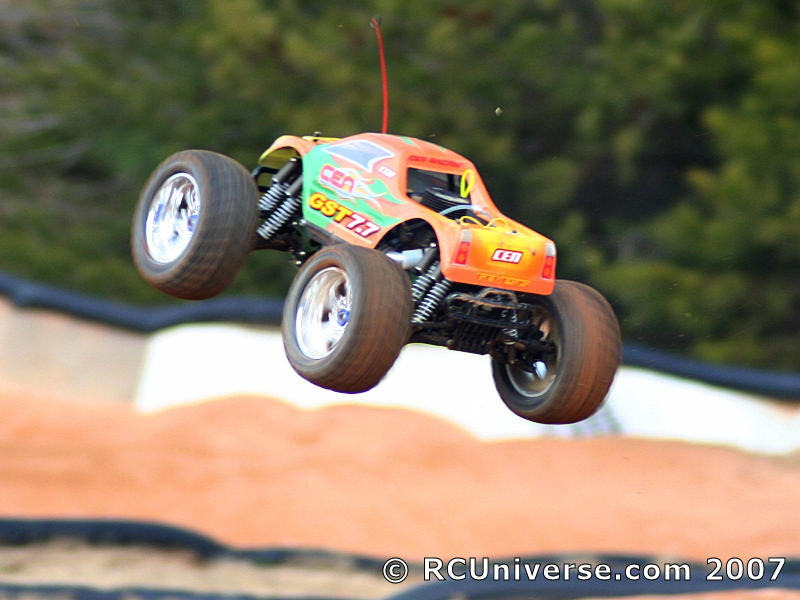 Be sure to check out the opening video that is solid-packed RC action! The Genesis platform has always had plenty of accessories packaged with it, and the GST 7.7 is no exception. 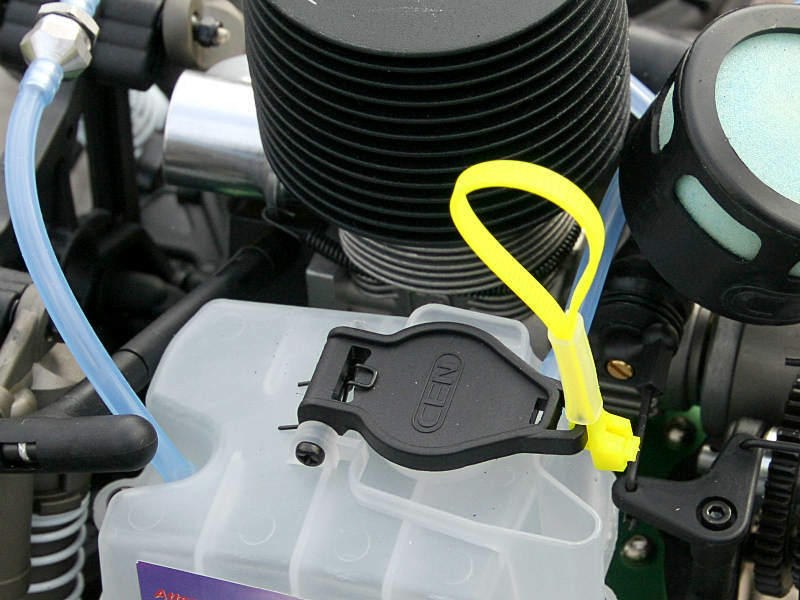 Inside the box you’ll find a nice 500cc fuel bottle, glow igniter and charger, and four-way wrench. 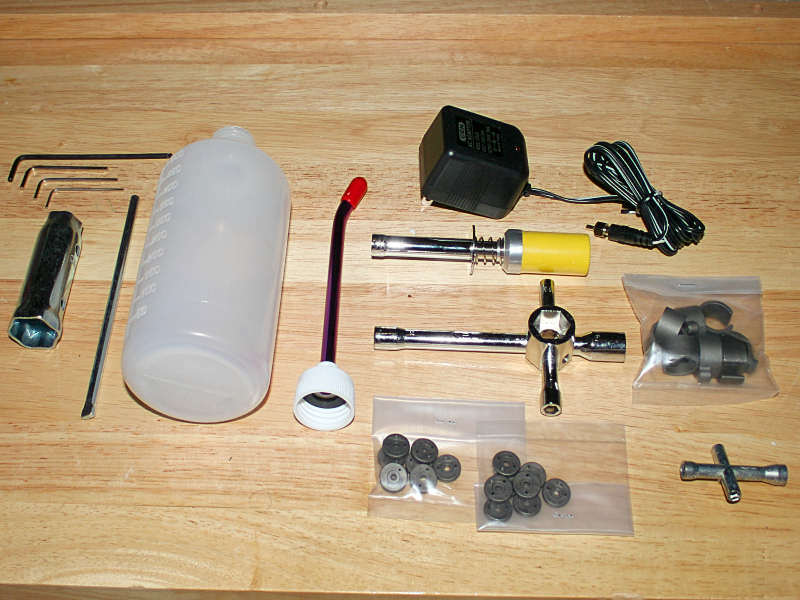 Other items include hex wrenches, wheel nut wrench, small four-way nut driver, and a host of shock accessories. 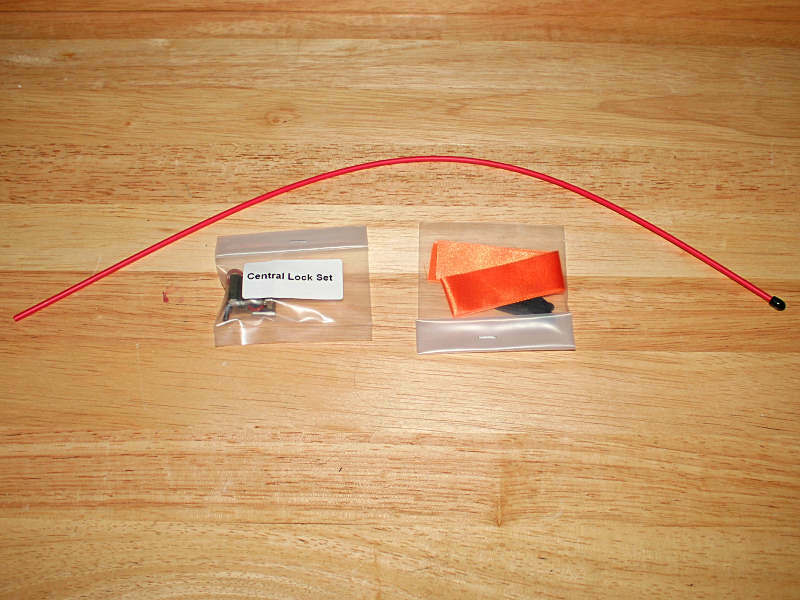 Rounding out the included items is an antenna tube, center differential locking set and frequency flag. If you’re familiar with the Genesis platform from my other reviews throughout the past couple of years, you’ll notice that the basic layout of the Genesis has stayed pretty much the same. After all, why change what works? 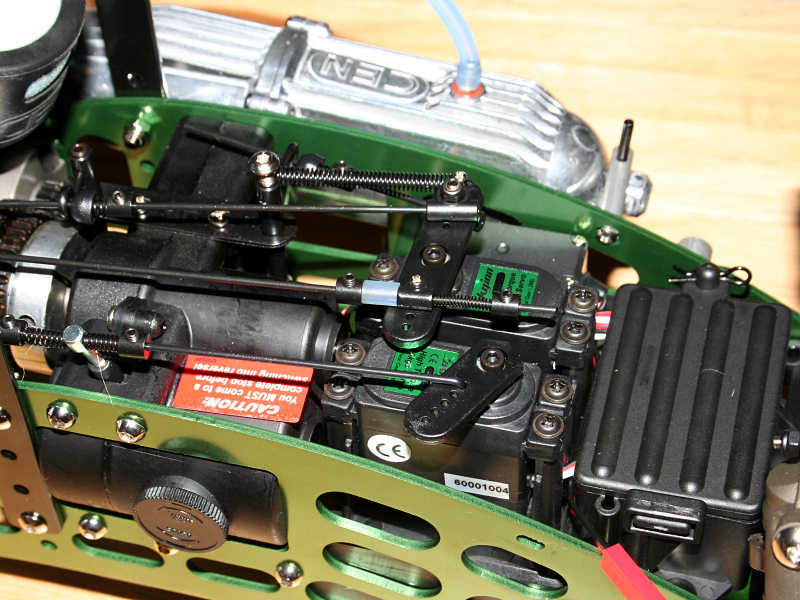 The most noticeable difference is the new green-colored chassis plates. I enjoyed this new change, as it departs from the overused colors that are typically sent throughout the hobby. 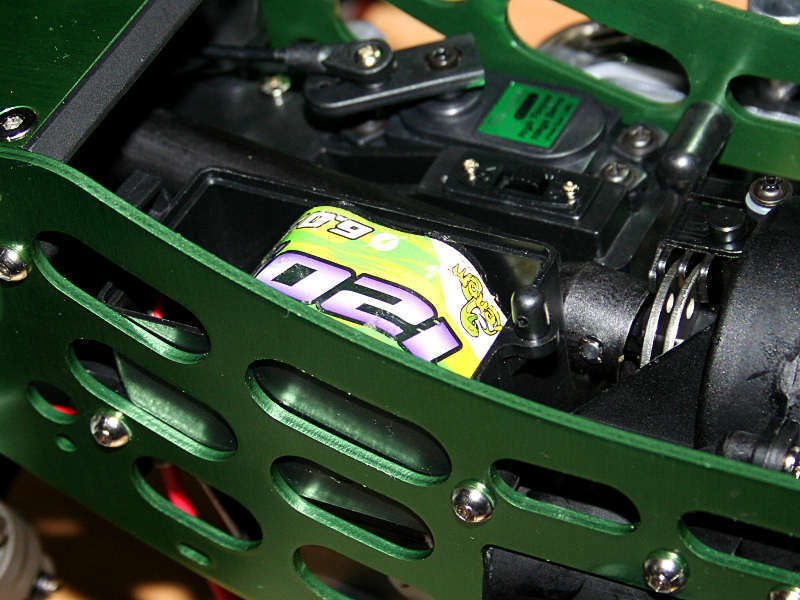 Between the new green color, and the size of the GST 7.7, I began to refer to the GST 7.7 as “The Hulk” while I worked with it! The twin vertical plate design used for the GST offers a very rigid and strong backbone for the truck. The horizontal plate that serves as a home for the engine locks into cutouts made in the vertical plates. When combined with the rigidity added by the front skid plate and transmission assembly, the entire chassis of the truck is up for any challenge dealt its way. Looking at the underside of the truck offers a new and different glimpse at the truck’s hardware. As before, you’ll find a hardened steel dogbone driveshaft for the rear of the truck and a thick plastic slider unit for the front. Positioned directly beside the front driveshaft is the battery box. It easily holds either the AA battery holder or a 5-cell hump pack. All of the lowermost exposed screws for the GST 7.7 are countersunk. While a monster truck sits high and won’t necessarily bottom out like a vehicle such as a buggy typically would, you never know what screws sticking out might get hung up on. So the countersunk screws make perfect sense. The fastener hardware used throughout the truck are made of stainless steel, and generally require the use of 2.5 or 3mm hex drivers to remove or reinstall them. 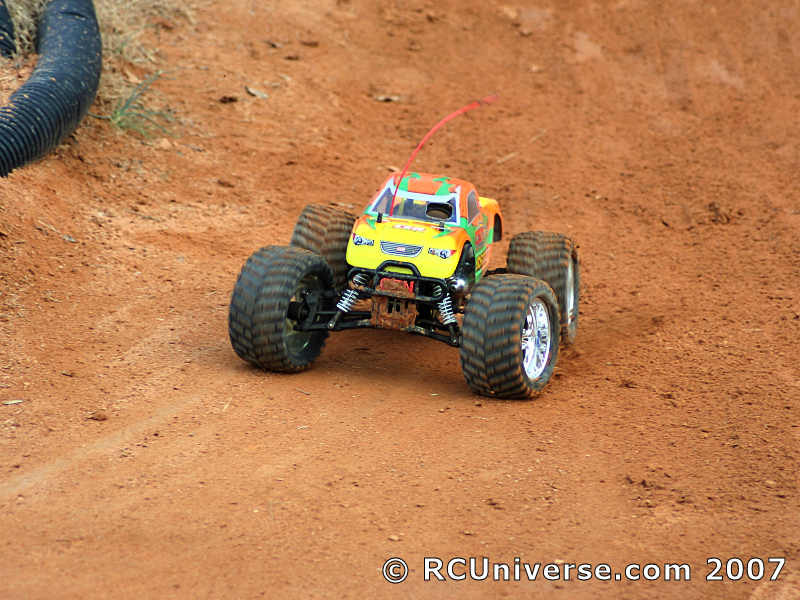 A 2.5 mm hex driver can be found in nearly any RC toolbox, however a 3mm driver isn’t used nearly as often. So if you want to have some good hex drivers on hand for the GST, be sure to pick up a 3mm driver. It’ll be a good investment for any GST owner. The GST 7.7 marks a turning point of sorts for the Genesis platform. 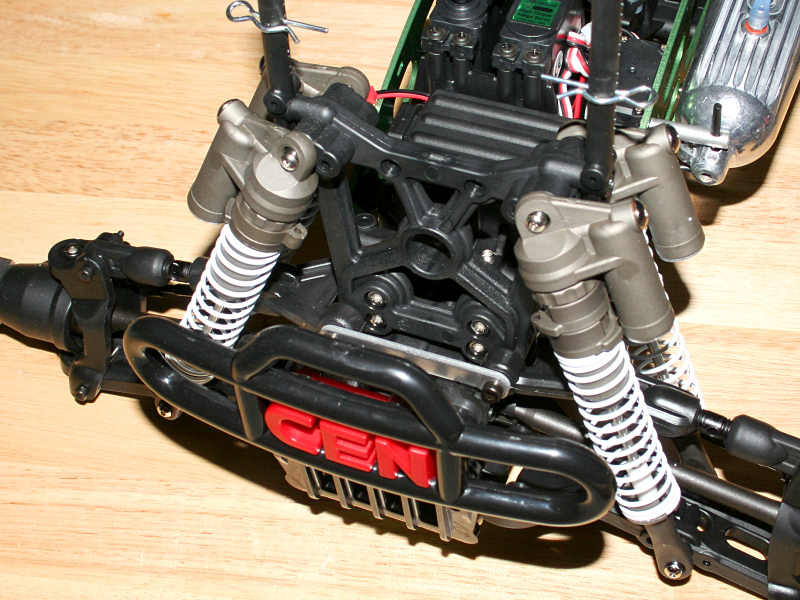 CEN has decided to ditch the ten shock suspension, that used horizontal upper shocks, in favor of a standard eight shock suspension. This approach first made its appearance on the Nemesis, and seems to suit CEN’s monster truck platform very well. After driving truck’s equipped with both shock configurations, I thought the eight shock version seemed to plant the truck much better in most instances. I’ll further my thoughts when I take the GST 7.7 out for a spin in the dirt. 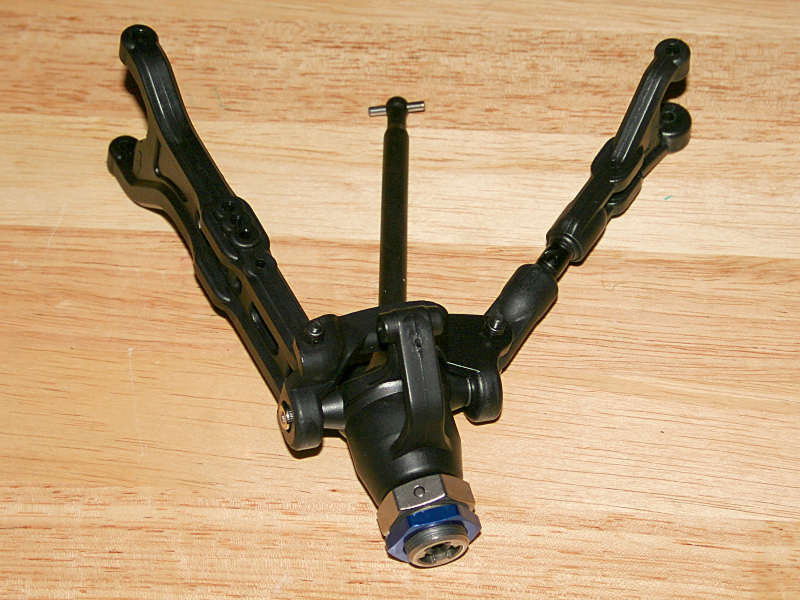 The upper end of the shock is given three shock positions, while the lower is given three as well. The suspension components for the GST 7.7 are super beefy. The large truck needs this type of construction, as its mass can inflict quite a beating upon the truck’s components. The super thick turnbuckle used for a camber link has a whopping diameter of 8mm, and has a hole in the middle to give you a place to insert a tool to help adjust it. To mount the suspension arms to the bulkheads requires the use of suspension pins, and the GST delivers a set that’s super strong and up to the task that’s required of them. The pins vary in length slightly, with the longer ones being used for the bottom arms. The pins are 4mm in diameter, and reinforced by 3mm aluminum tiebars. The upper pins are reinforced at the outer side of the bulkhead, while the lower suspension pins are reinforced at both ends by 3mm tiebars. Locking nuts hold the lower pins in place, while the upper pins thread into a plastic support bar at the inner side of the bulkhead assembly. The axle carriers are oversized and beefy just like the rest of the truck. Inside the carrier you’ll find a pair of bearings. The outer bearing is 8x16x5mm and the inner bearing is 10x19x7mm. The axle stub is 8mm thick on its outer end, and then increases in diameter to 10mm for the inner bearing. 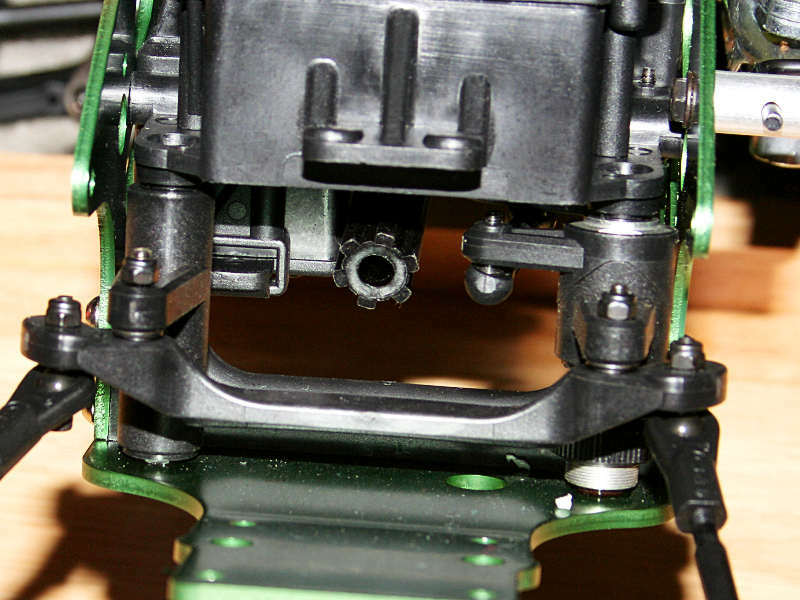 A 23mm hex adapter slides over the axle and a 3mm axle pin slide through the adapter and axle. A grub screw threads into the axle to hold the axle pin tightly in place. A 1.5mm hex driver is used to tighten or loosen the grub screw. The steering block is held into the c-hub by a pair of stainless steel cap head screws. The screws pass through a set of steel inserts that fit into the c-hub and prevent you from over tightening the screws down and which would hinder the assembly’s ability to freely rotate. 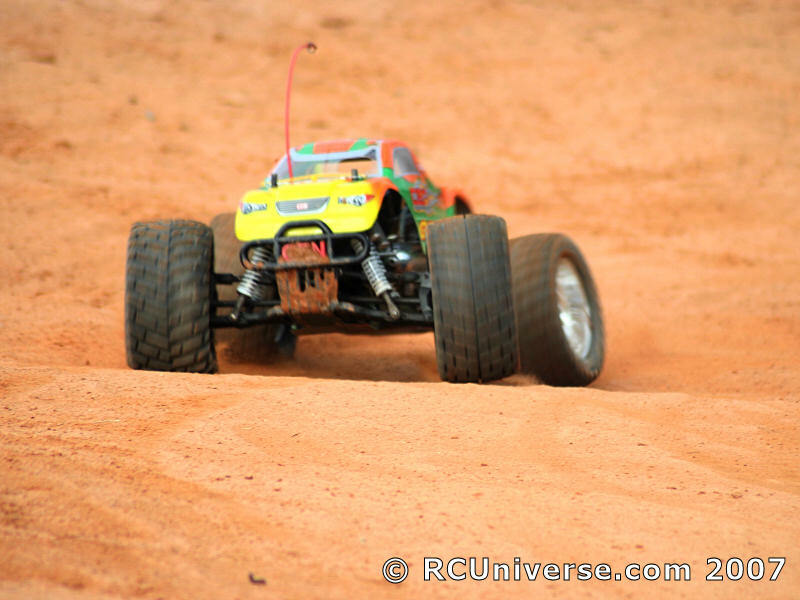 The length of the axle that spans from the axle stub to the differential has a thick diameter of 8mm. Take note of the construction of the CVD-style axle. CEN uses e-clips to secure the cross pin for the axle in place. This provides a much improved design over the traditional approach of simply using a grub screw to hold the cross pin. While maybe considered being nitpicky, I do wish that the 23mm wheel nuts were not anodized in blue. Green would seem more appropriate, given the color used for the truck’s chassis plates. At the very least a natural silver finish would blend in with the chrome wheels. The blue nuts just seem completely out of place. 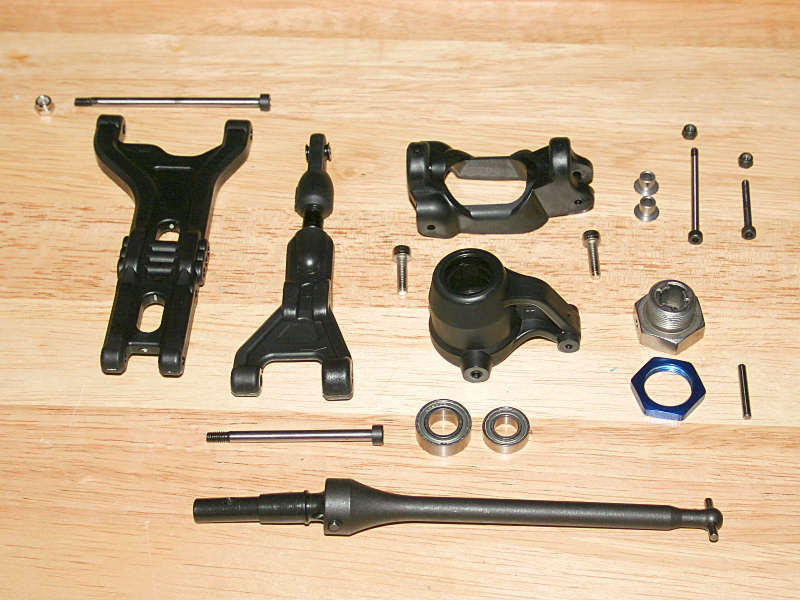 The suspension components of the GST 7.7 follow the same trait they have since the inception of the truck. They are universal at each corner of the truck, which means that a spare suspension component will work anywhere on the suspension. This makes things easy, and virtually guarantees you’ll have a spare part on hand. Given this concept, the rear of the truck is nearly identical to the front. However instead of the use of steering links, you’ll find 6mm toe links instead. This is the only real difference between the two ends of the truck. Both ends also sport a new blackened set of bumpers. I like these much better than the chrome ones used on the previous versions of the truck. They don’t seem as toy-like with the black finish as they did with the chrome. I do wish that they offered a little more protection to the truck in the form of absorbing an impact however. The bulkheads that support the differentials are braced with webbing to reinforce their stress points. 6mm aluminum braces reinforce the two halves and are secured with the bumper mount screws. 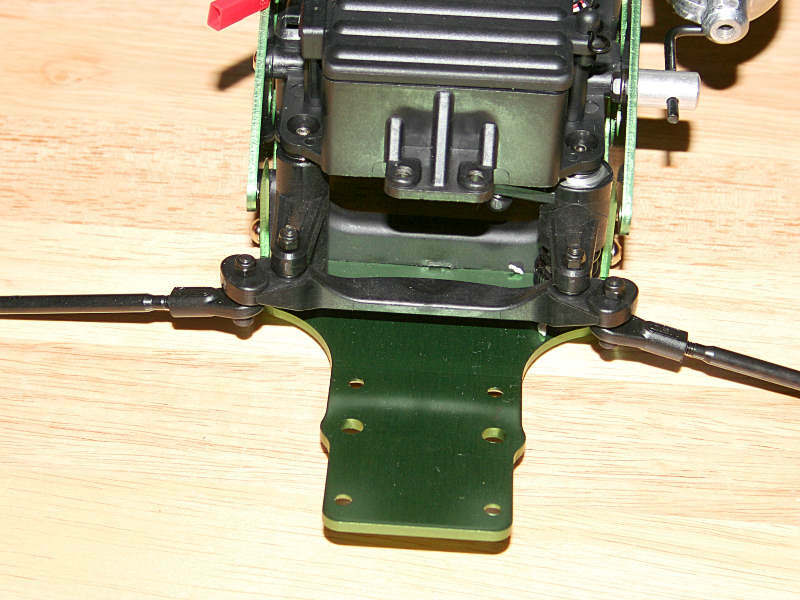 A thick rear plastic brace reinforces the rear of the assembly, while it also serves as a mounting point for the upper suspension arm mounts. The mounts for the lower suspension pins use steel bushings to help the pins pivot smoothly. 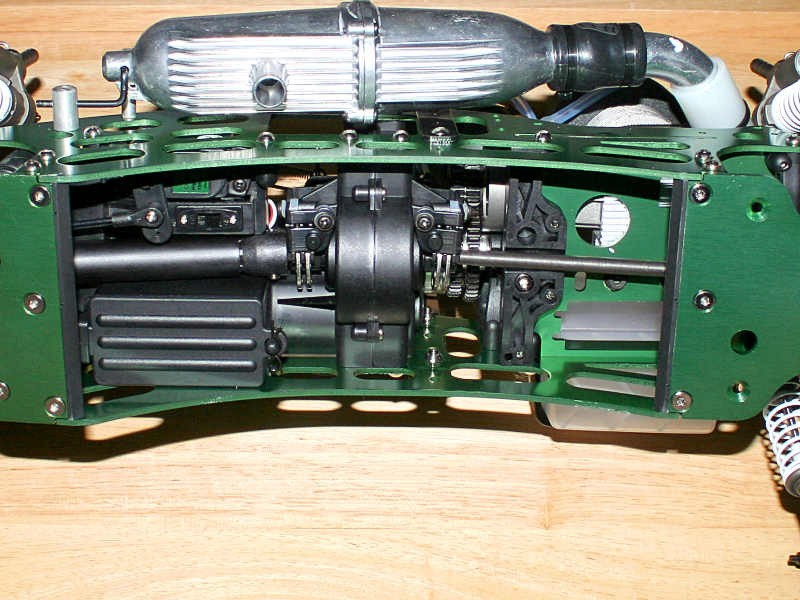 The differential is placed in a plastic case that splits into top and bottom sections. A single screw holds the assembly together, with a plastic ring keeping the halves tight at the rear of the housing. 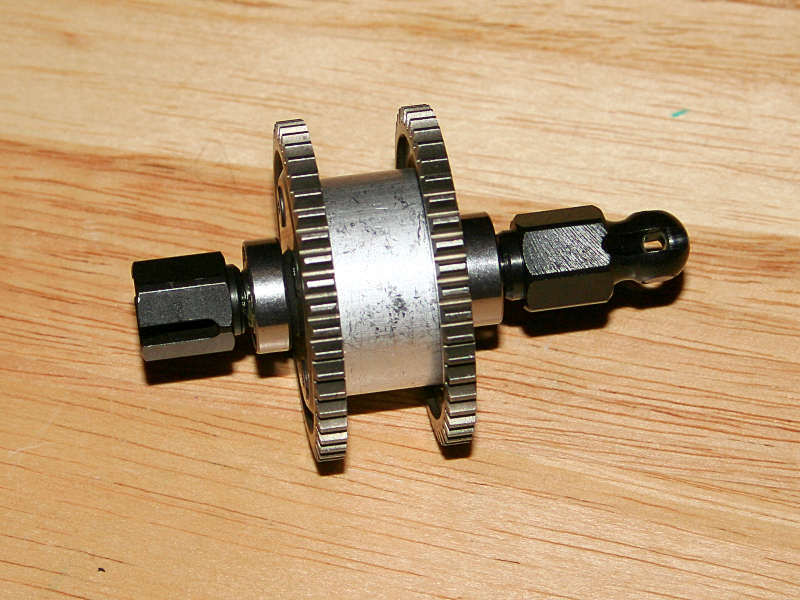 The axle is fitted to the pinion gear’s shaft and held tight by a grub screw. When peering inside the differential housing, you’ll get a good glimpse of the straight-cut ring and pinion gears. 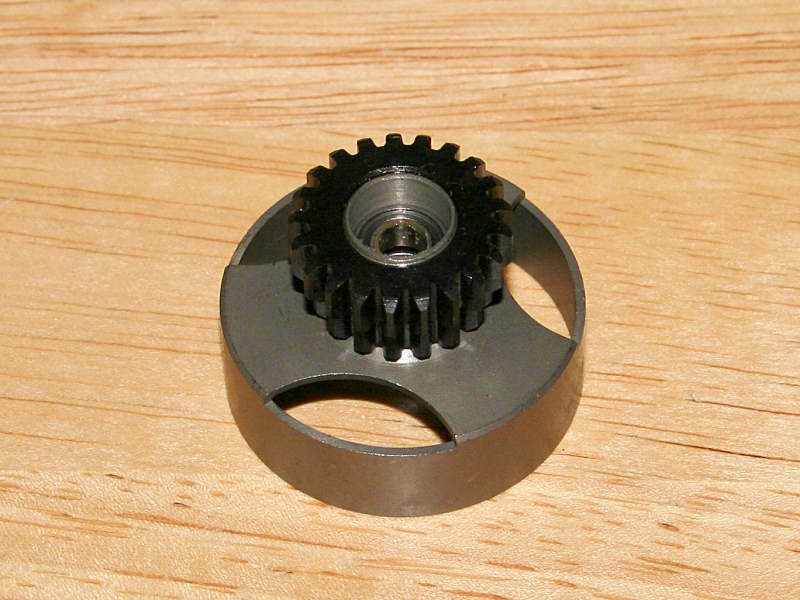 The differential cup is aluminum as before, and is reinforced well with a full six gear assembly inside the unit. 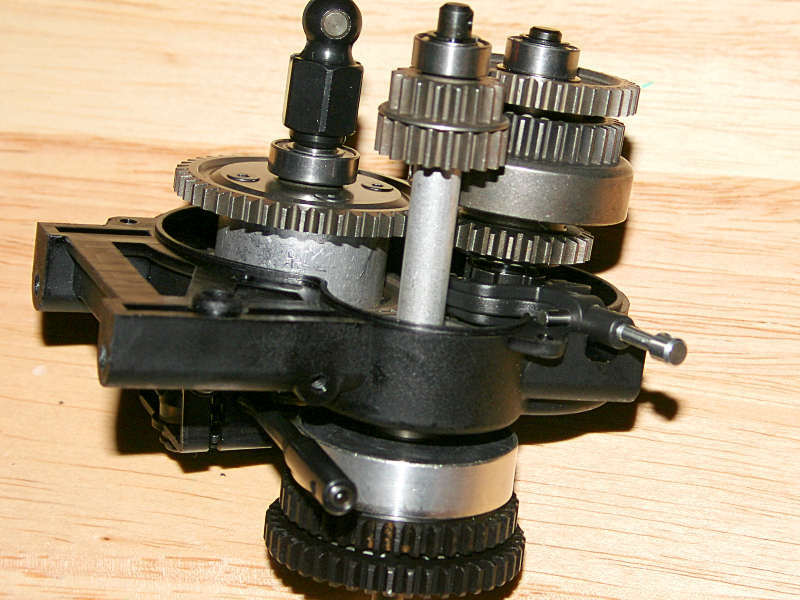 Both the differential and pinion gear spin on a pair of 8x16x5mm bearings. The two driveshafts found on the GST 7.7 differ substantially in their construction. However this has worked perfectly fine in the past and I foresee no problem given its current track record. The rear driveshaft is a 6.5mm hardened steel driveshaft, while the front is a plastic slider unit that’s built well enough to take the abuse the GST will dish out with it’s .46 cubic inch motor. The standard shocks for the GST are carried over from the previous versions of the Genesis. They, like the driveshafts, have worked well. So there’s no need to change what is already known to work well. 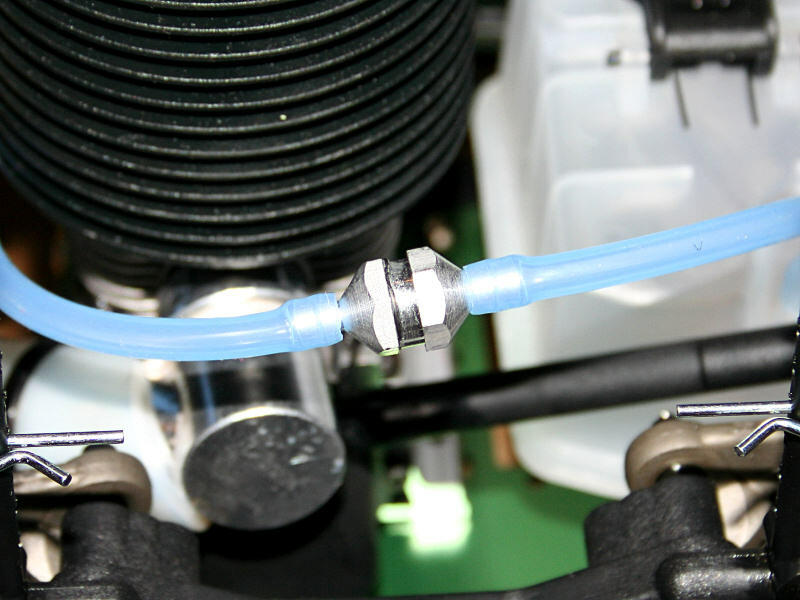 The shocks use plastic bodies and caps, and the reservoir does hold additional shock oil. 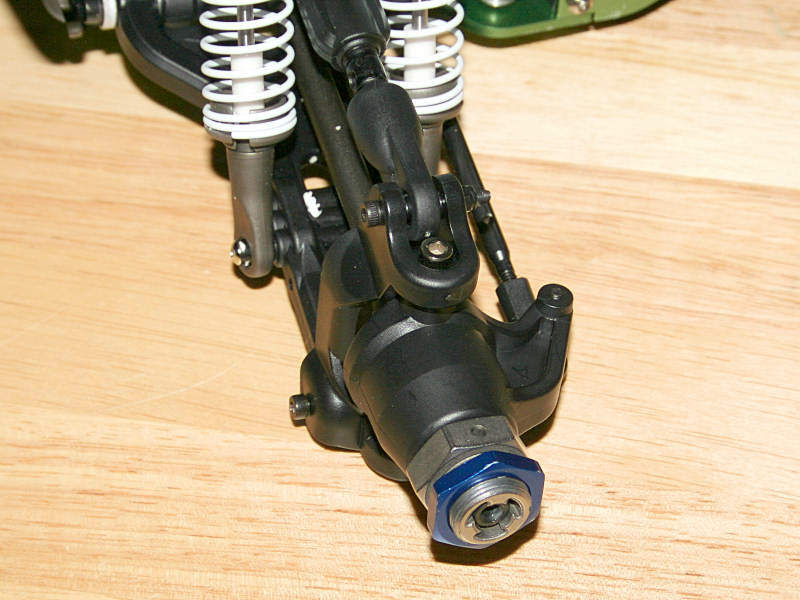 The bleeder screw on the shock makes filling the shock much easier than relying on the bleeding via the cap alone. The stainless steel shock shaft is 3.5mm in diameter, and the piston head inside the body is secured by a locking nut. A section of silicone sits over the shock shaft, preventing the suspension from bottoming out too harshly, and adding a progressive feel to the suspension as it reaches the limits of compression. Plastic preload spacers adjust the vehicle’s ride height, while a set of CEN’s stiff racing springs used for the Nemesis round out the shocks. When I think of the Genesis platform, one thing sticks out above all others it seems. That item would be the massive tires it’s equipped with. Just the wheels alone are 7.5 inches high. They are finished in chrome, giving them a realistic look, even down to the faux lug nuts. The slotted chevron-style tires are a medium compound intended to provide long life, as the GST’s engine will work them hard. Inside the tire a foam insert maintains the tire’s shape and helps to support the truck’s weight. 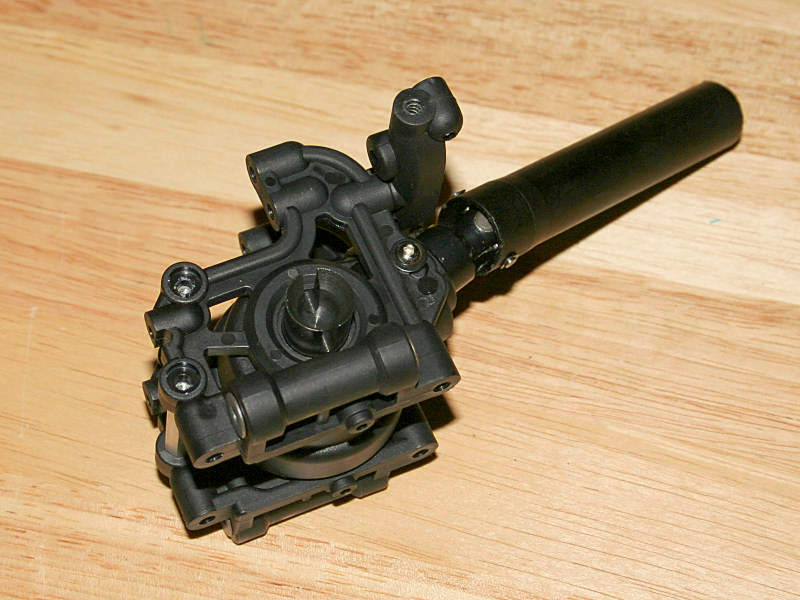 The GST 7.7 uses a bellcrank steering linkage assembly to get the wheels turned when they’re called upon. The posts pivot on 6x10x3mm bearings, and are connected by a heavy duty plastic draglink. Steel turnbuckles connect the draglink to the steering hubs. The tension of the whole assembly is controlled by a servo saver that’s mounted on the truck’s left-hand post. The steering action is ultimately controlled by a high-torque servo that provides 144 oz-in of turning power. 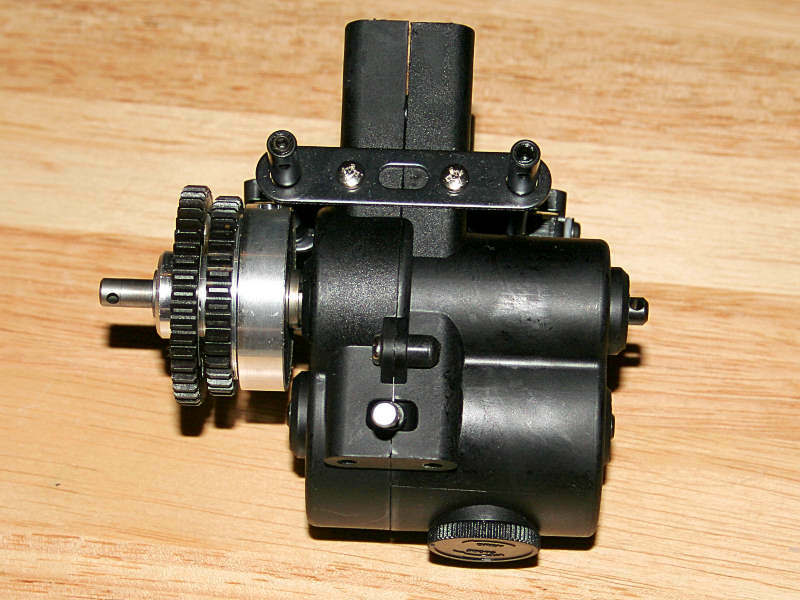 You also won’t find this steering servo to be a wimpy plastic geared servo either. CEN packs this truck with a metal geared servo, as the large wheels necessitate some serious hardware backing them up. 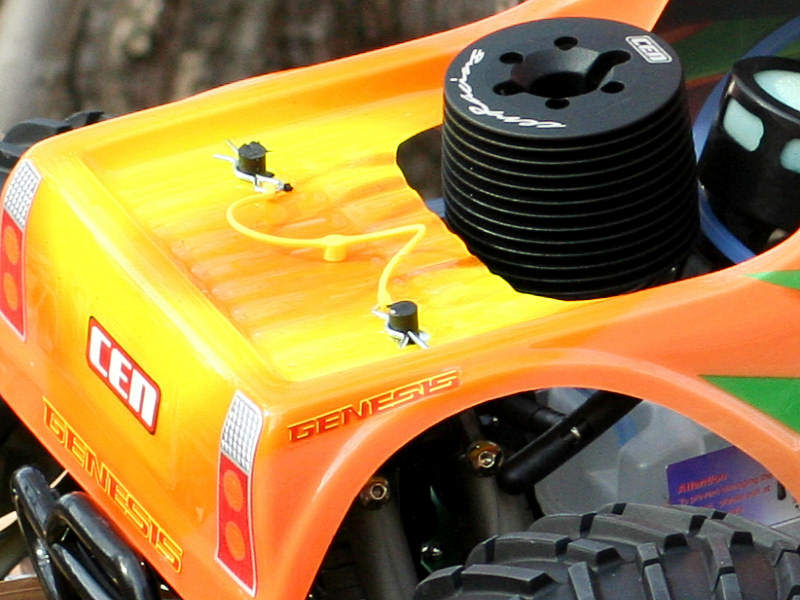 The servo horn provides optional mounting holes to increase the steering angle if you desire, and right beside the servo you’ll find a power switch for the truck’s onboard electronics. The GST’s transmission gives new meaning to the phrase “heavy metal”. While the outer housing is plastic, you’ll find out that’s about the only thing that is however. The braking assembly for a truck of this size and weight must provide plenty of rock solid stopping power. So CEN made sure that the GST didn’t leave anything to chance. Cross-drilled stainless steel disks are sandwiched in between stainless steel brake calipers. Metal on metal braking may provide too much stopping power for some vehicles, but the GST 7.7 is far from being an ordinary run of the mill truck. A metal frame keeps the whole braking assembly in perfect working order. The GST 7.7 provides you with a true split braking assembly, which allows you to adjust the front and rear braking strength independently of each other. Up at the top of the assembly, a 2mm brace helps reinforce the two posts together. The hardened steel spur gears are an example of the heavy-duty construction you’ll find throughout the GST’s transmission. You might be wondering how the GST manages to have three speeds with only two spur gears visible. The answer lies inside the transmission, as we’ll see shortly. In between the two spur gears lies the first shift hub that controls the change from first to second. 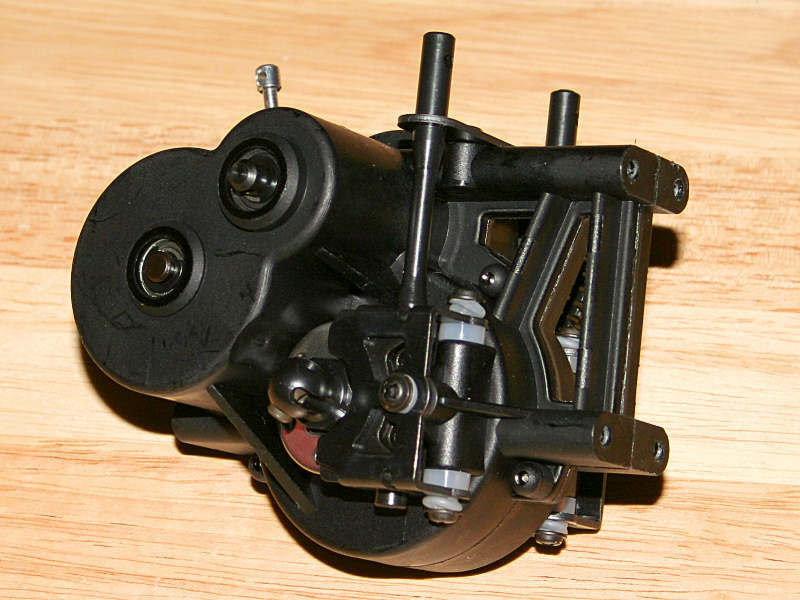 The hub assembly has two adjustment screws, so keep that in mind when making adjustments. You’ll need to turn both screws equal amounts. At the top of the transmission you find the reversing lever sticking up out of the transmission. The reversing linkage connects to the lever, allowing the truck to switch from forward to reverse once the radio calls upon it to do so. Almost directly below the reversing lever you’ll find a round plastic plug. This plug covers the hole that allows you access to adjust the hub that controls the second to third speed shifting point. Once the transmission is opened, the real beefy nature of the GST’s transmission comes to light. We’re talking seriously tough gears and yes they’re heavy. Given the size and mass of the GST 7.7 though, a little more weight isn’t going to be a big deal. Strength is a paramount concern though, and the reasoning behind the need for this sort of gear assembly is solid. Sharp eyes will recognize the shifting hub assembly directly under the gears mounted close to the center of the transmission. 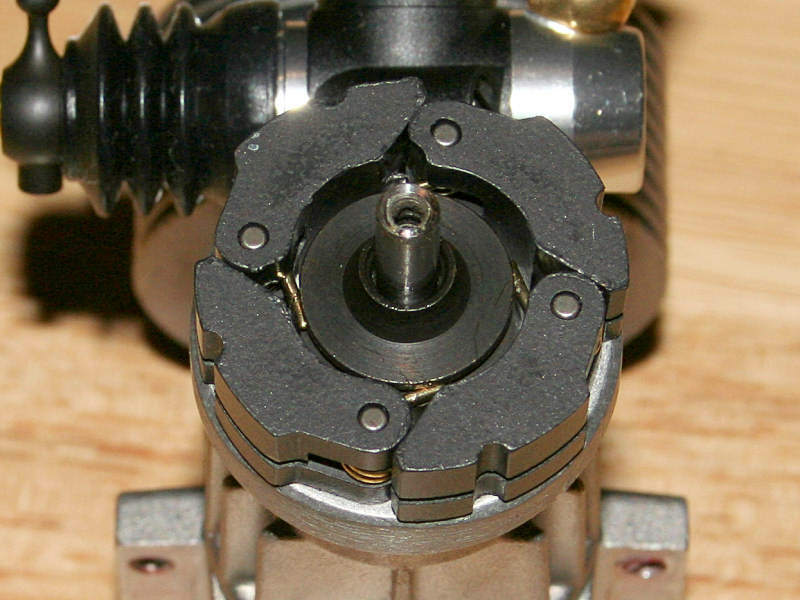 The hole in the side of the hub allows you access to the internal grub screw that tailors the shifting point. 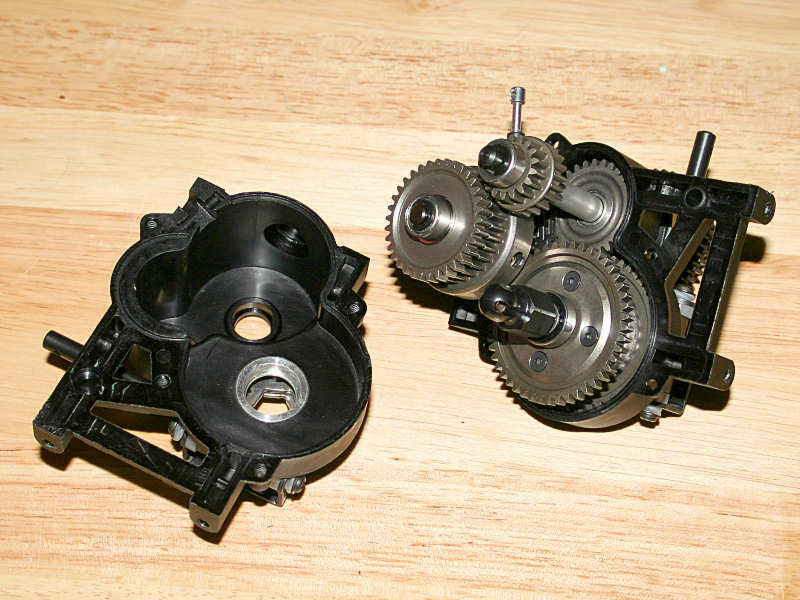 The large gear assembly at the bottom of the transmission is the center differential. The differential is in an unlocked state out of the box, allowing you to use differential oil to tailor how the power is sent from the front to the rear of the truck. This also allows you to have the previously mentioned independent braking. However, should you wish to lock the center differential, and make it act like a standard transmission, you can use the locking set found in the bag of accessories. With the amount of detail paid to assembling a well built transmission, it would be pointless not to have a complete set of ball bearings used to allow the drivetrain to rotate smoothly. CEN took this to heart and stacked the transmission with ball bearings as necessary. The CEN GST is powered by a mammoth .46 cubic inch (7.7cc) engine. This engine is the largest powerplant you’ll find in any current monster truck. Genesis veterans will recognize that CEN has changed the cooling head’s color from red to black; however not as apparent is the fact that CEN has reworked the engine’s internals to provide a boost in power and torque. The cooling head is a two piece design, which provides you with a separate head button. The head button is an easy replacement should the threads become damaged. 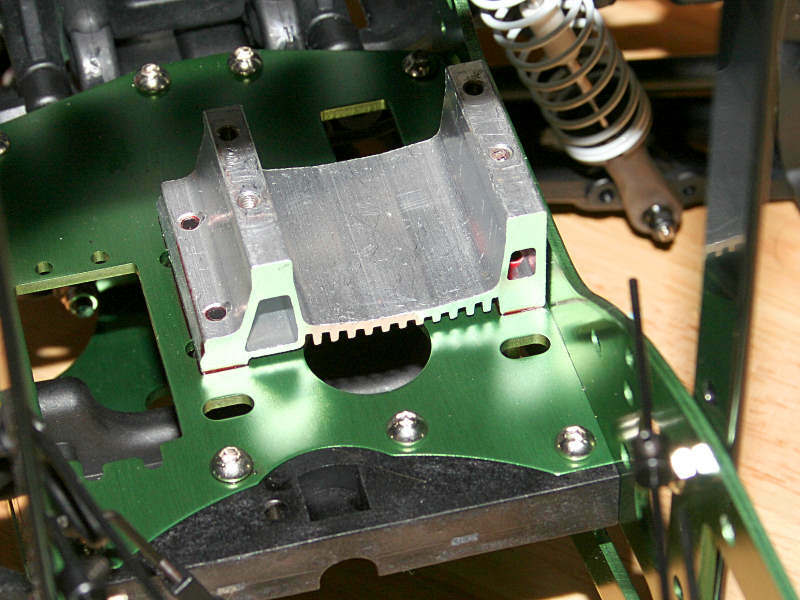 A total of six screws secure the cooling head, head button, and engine block together. 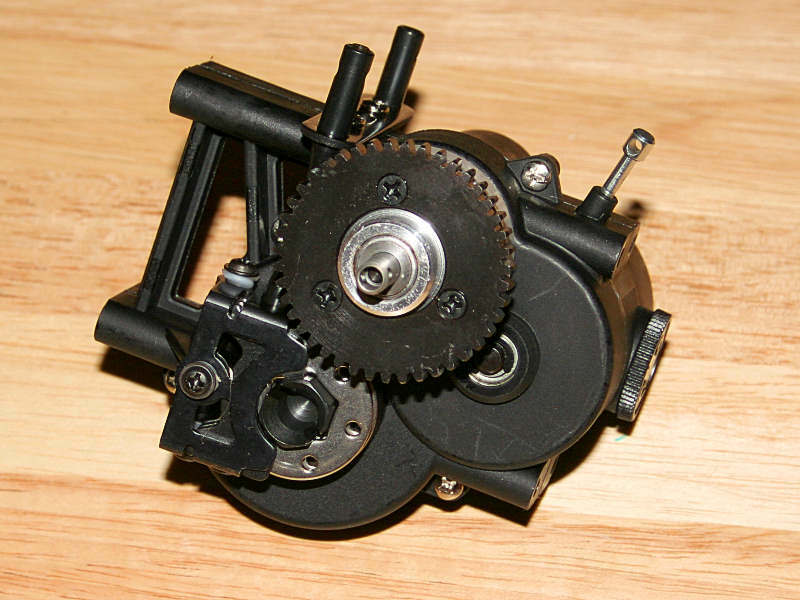 A revised recoil starter, that offers enhanced reliability over the previous version, is mounted to the rear of the motor as a means to start it. The engine block has cooling fins molded into it, allowing the engine to assist the head with shedding heat created during the combustion process. At the front of the block you’ll find a redesigned aluminum-bodied slide carburetor. CEN claims the new design is easier to tune, and provides a much better air and fuel mixture than before. 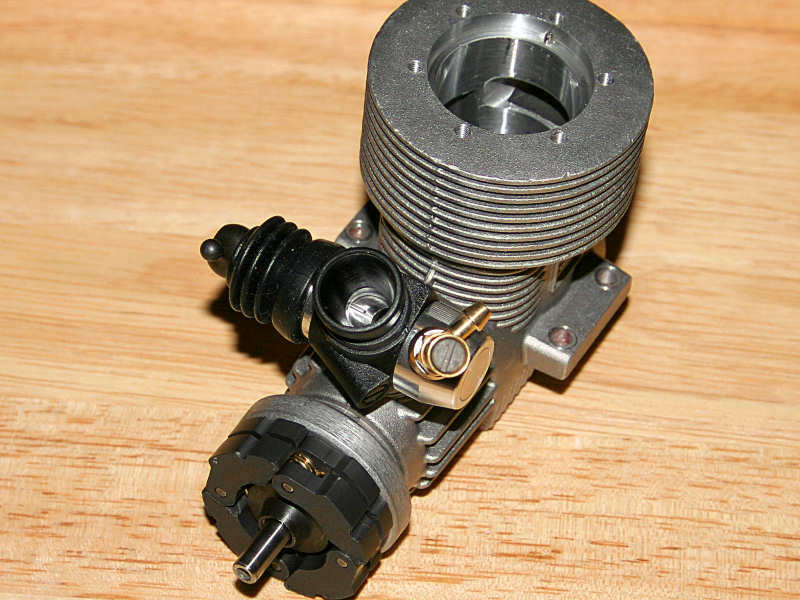 The carburetor features two adjustment needles, as well as an idle screw. The high speed screw and idle adjustment are easily reached with the engine in the truck. The low speed needle is a little trickier, due to the fuel tank positioned beside it. Adjustment is not impossible; it just requires a proper angle to reach the needle. 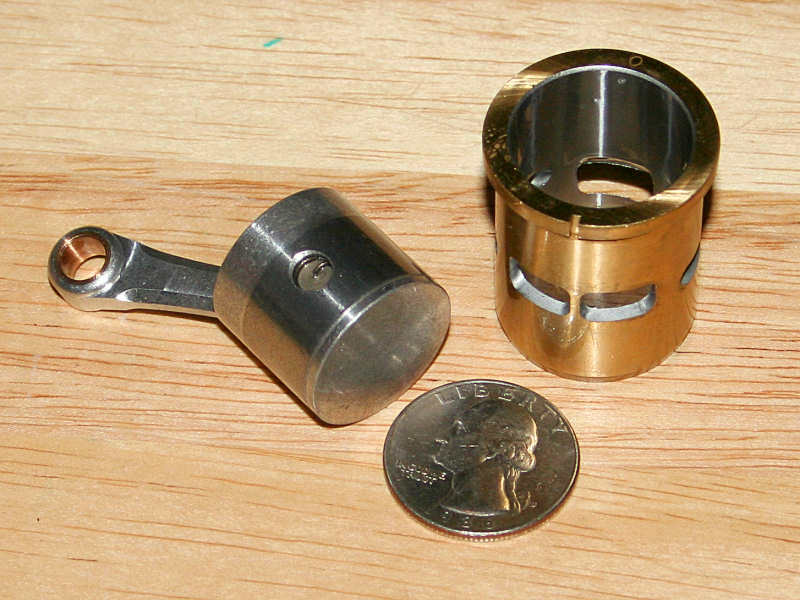 The clutch bell found mounted onto the GST’s engine rides on a pair of 5x10x4mm bearings. It uses dual pinion gears, one with 21teeth and the other with 17teeth. The bell housing is vented, helping the clutch shoes to shed any heat they build up as they grip the clutch bell and transfer the engine’s power to the transmission. The CEN GST’s 7.7 motor uses a composite four shoe clutch assembly to transfer the power from the torque-filled motor to the rest of the drivetrain. Each clutch uses its own spring, as is typical with a big block clutch setup. The heavy duty composite clutch shoes provide excellent wear and grabbing characteristics, without the need for frequent inspection like you’d have with aluminum clutch shoes. 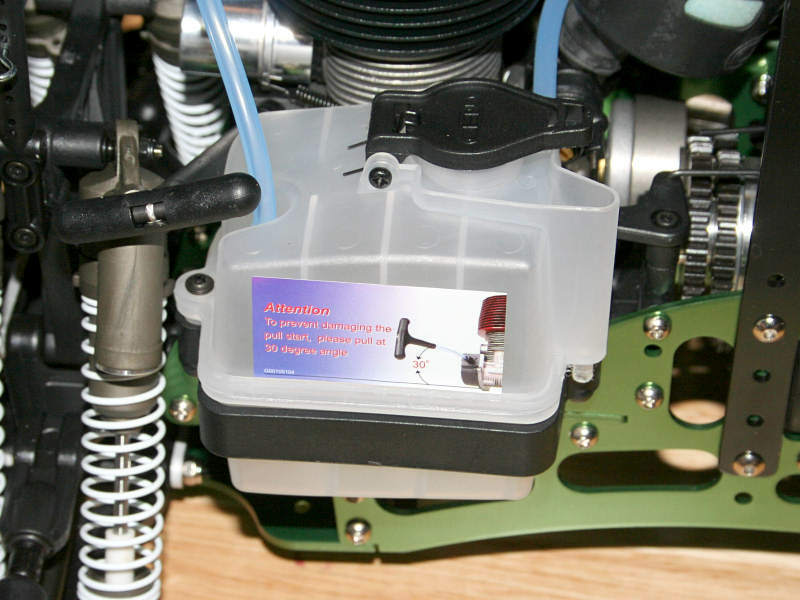 The engine uses a pullstart for starting purposes, which requires the use of a backplate with a one-way bearing for it to work properly. The backplate seals itself against the engine block via a rubber o-ring. 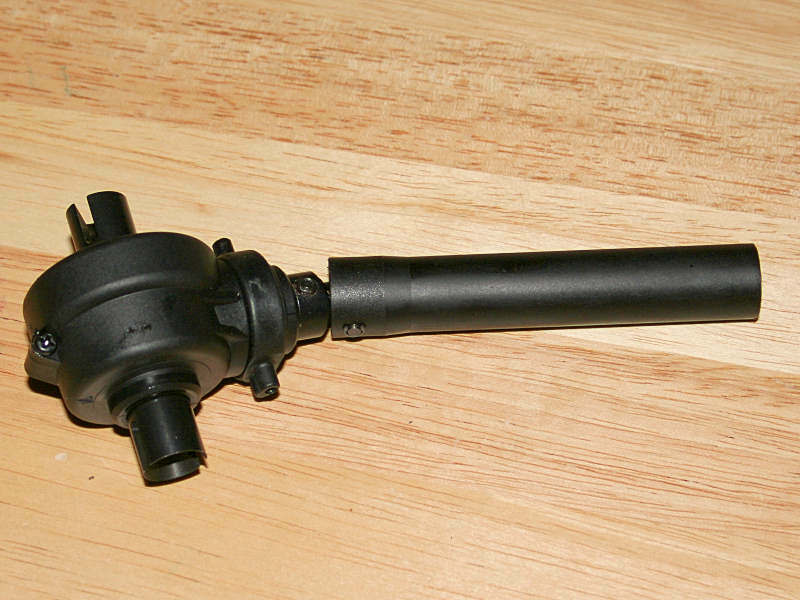 The starter shaft has a groove in its inner-facing side which the crankshaft pin fits into. This allows the pullstart to rotate the crankshaft when the starter is pulled. For those seeking a more user friendly starting method, CEN offers an optional rotary starter assembly for the GST. CEN didn’t leave the engine for their popular platform alone, as power improvements were a high priority on their list. The crankshaft design has been reworked to enhance airflow. The center chamber’s size is simply staggering, but not a surprise. 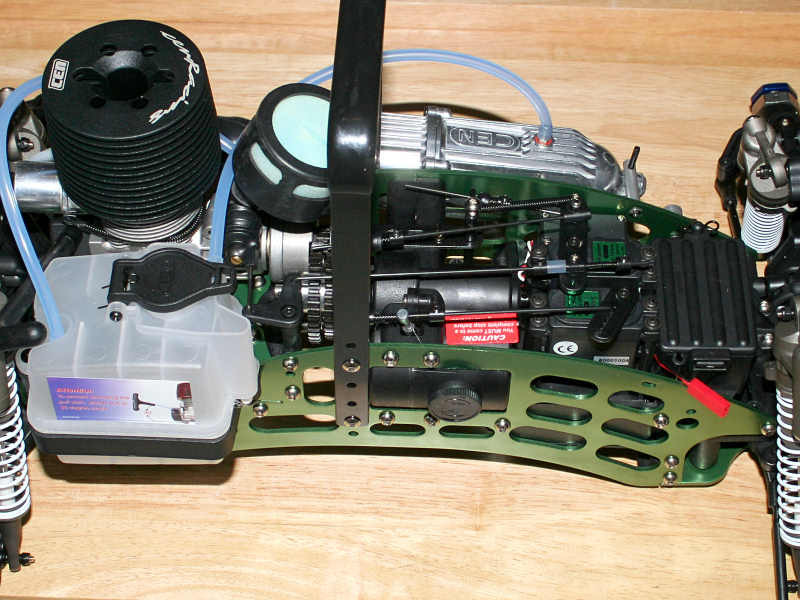 A big motor such as the CEN 7.7 requires oversized components such as this. 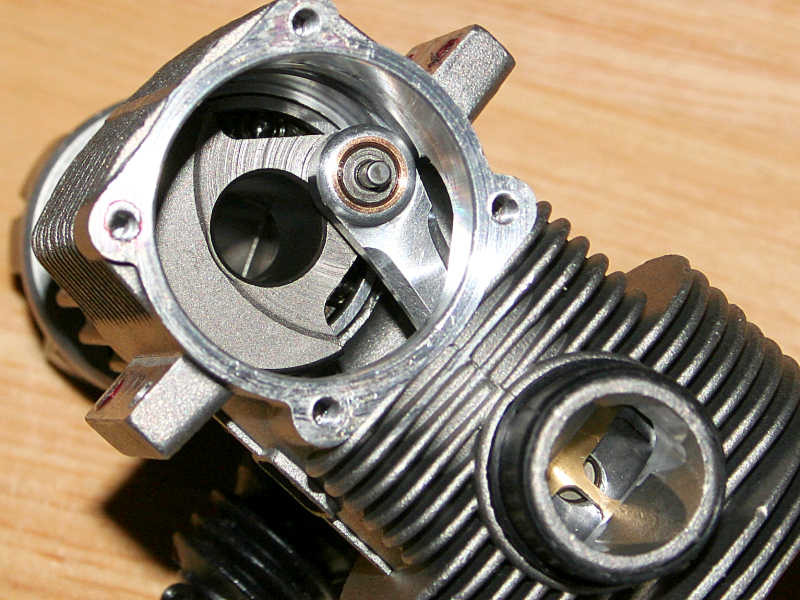 The crankshaft nub, that holds the connecting rod in place, features a spring loaded pin that mates to the backplate as discussed earlier. Directly beside the opening for the engine’s backplate, you’ll see the exhaust port. Take note of the dual exhaust ports in the sleeve. The exhaust port in the block is so huge that it simply required the use of multiple ports on the sleeve. Otherwise there would be a risk of the piston striking the opening in the sleeve as it rose to the top of the chamber. Nothing on the GST 7.7 exemplifies super-sized like the piston and sleeve from the motor. It’s hard for one to get an idea of their size from a picture, so I’ve shown them alongside a quarter to help establish the relativity of their size. Again, take notice of the dual exhaust ports, located right below the notch in the top of the sleeve. 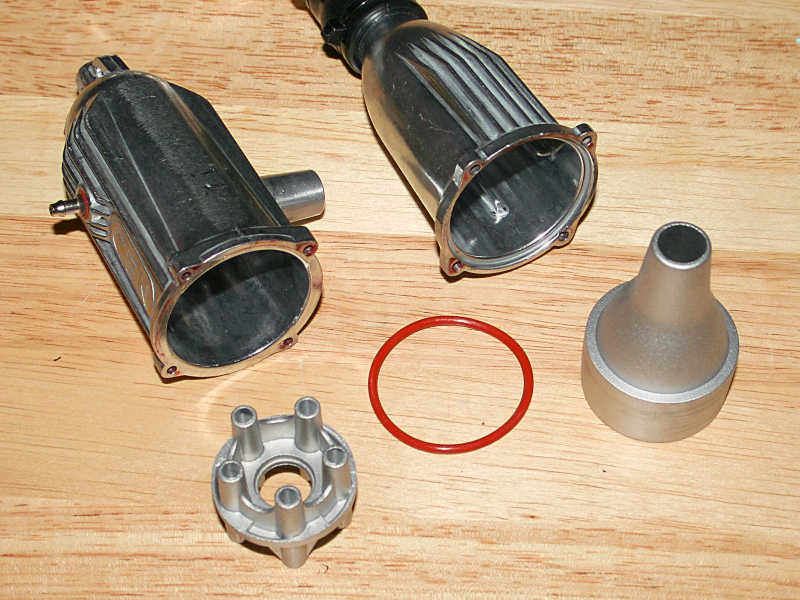 The chrome-plated brass sleeve uses a total of three intake ports to fill the combustion chamber with incoming air and fuel. The piston uses aluminum construction to provide a lightweight yet strong reciprocating assembly. To help provide proper lubrication, CEN has placed an oil groove close to the top of the piston’s crown. The connecting rod is knife-edged, and uses pressed in brass bushings at both of its ends. Oil holes help lubricate the bushings, as they provide the proper tolerances while the motor spinning madly making its power. One of the defining features of the Genesis platform has been the pipe that CEN supplies the truck with. The large aluminum pipe is instantly recognizable, and is marked with the CEN logo. Inside the pipe you’ll find a baffle that helps tame the noise level of the truck’s large powerplant. If the exhaust’s noise level doesn’t concern you, and you’re looking for a power boost, open the pipe up and remove the two sections of the baffle. You’ll see a noticeable difference in the truck’s powerband. A truck like the GST 7.7 works up a serious appetite for fuel. 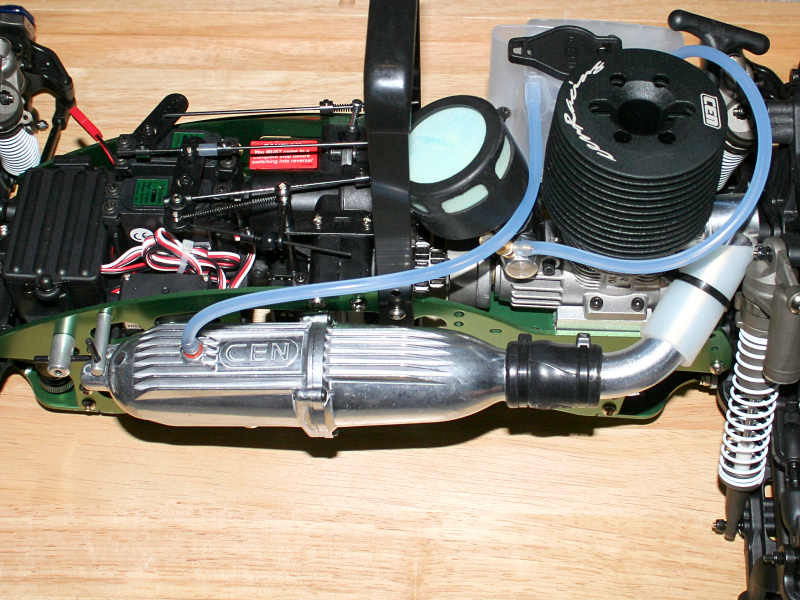 So to keep runtimes between refills long, CEN uses a large 220cc tank to hold the necessary dose of nitro fuel. The tank uses a spring-loaded lid to keep the pressure inside. It also sports a channel around the lid, to route any spilt fuel away from the chassis, allowing it to drop off of the truck instead. The tank is held alongside the right-hand chassis plate by a mount that wraps around its lower half. 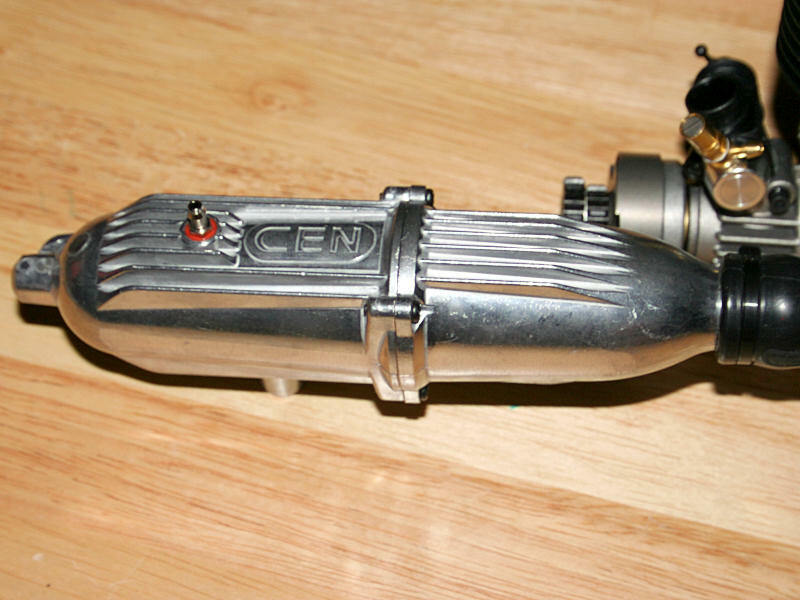 To secure the engine to the chassis, CEN employs the use of an aluminum engine mount. Cooling fins are placed on the underside the engine mount to increase the mounts surface area to help dissipate engine heat. The single piece mount bolts to slots in the chassis that allow you to adjust the gap between the spur gear and clutch bell as necessary. 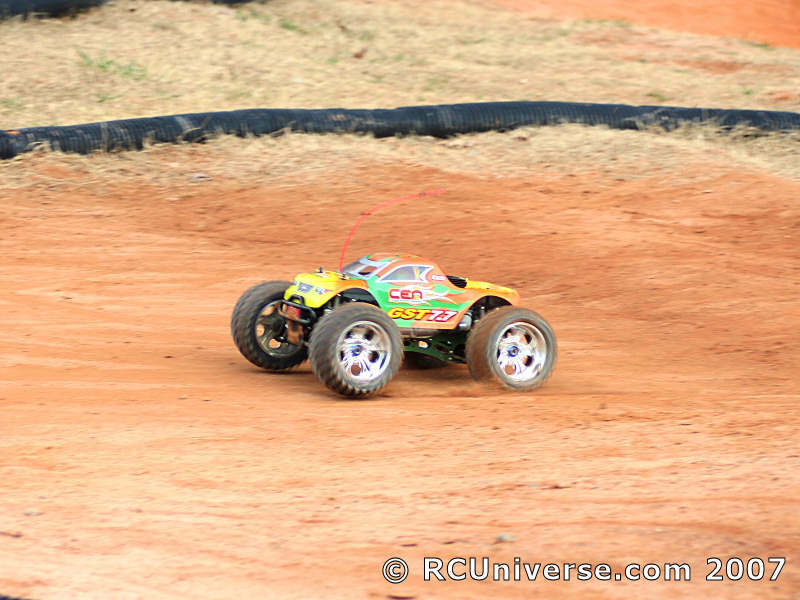 Directly in front of the transmission you’ll find the servos that control the throttle, braking, and reversing functions. 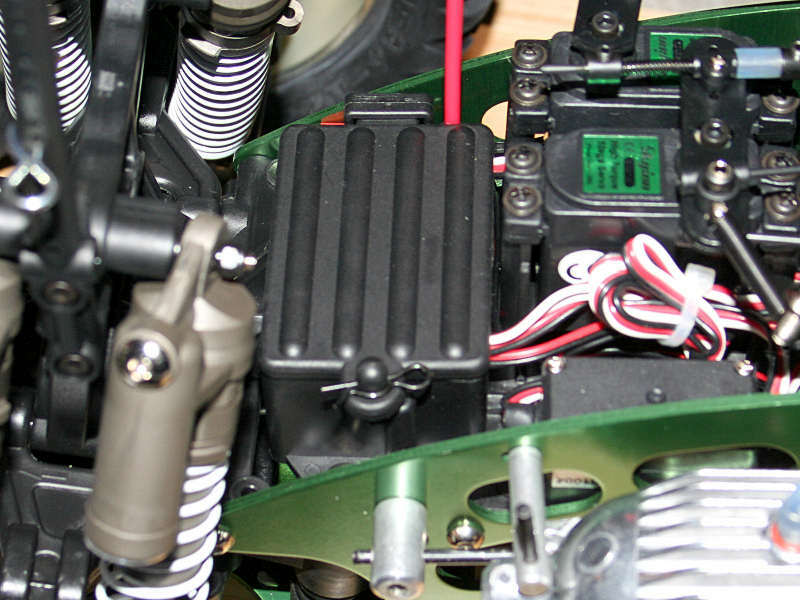 All of these servos are the same model that is used for the steering function, so they provide the same features in regards to torque and metal gears. 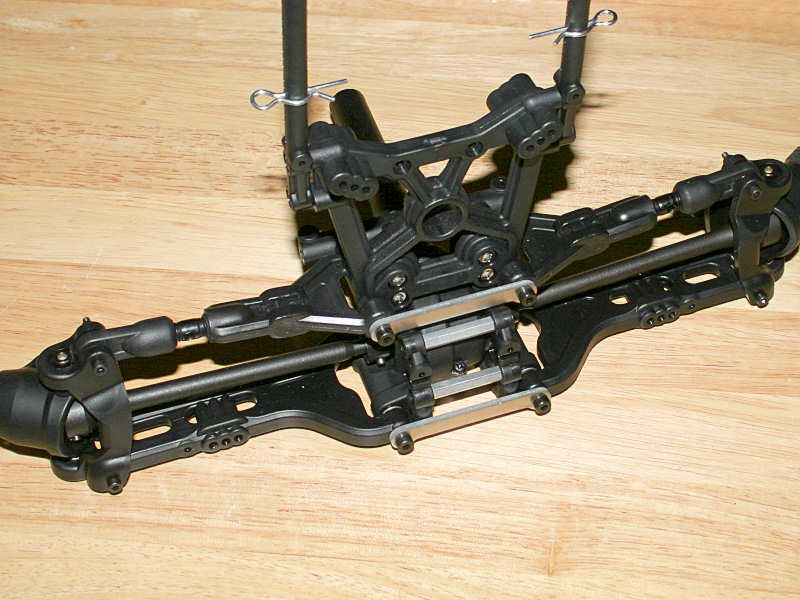 The linkage assemblies utilized are adjustable to account for various changes that may need to be made. CEN now equips the throttle servo with a return spring to close the carburetor in the event the truck’s onboard power source would fail. In front of the servos you’ll find the truck’s receiver box. 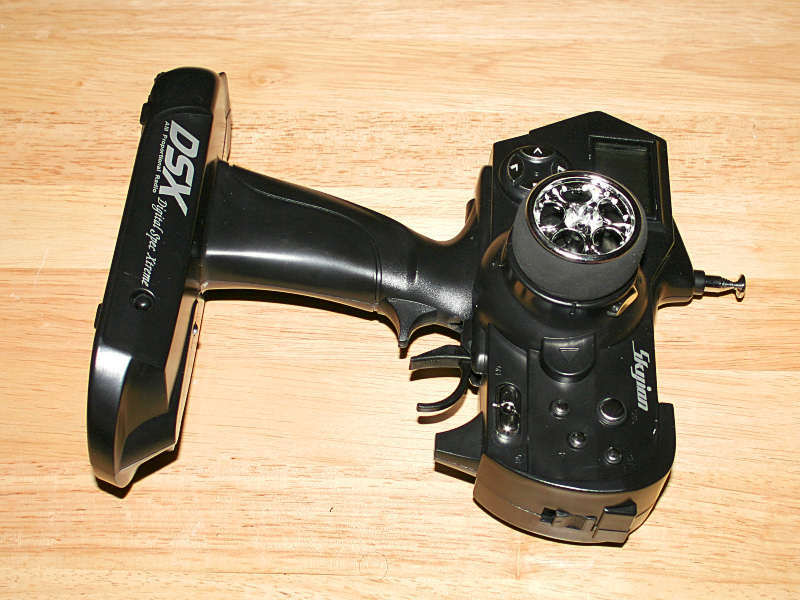 It’s plenty capable enough of holding the truck’s receiver, and is large enough to hold about any receiver you’d ever want to use with the GST 7.7 should you desire to swap out the vehicle’s radio components. The lid is held securely shut via a single body clip. The Skyion transmitter that CEN provides packs a nice punch for an AM radio. It features a digital display as well as digital trim adjustments, placing it above radios that use analog knobs. Analog knobs easily get knocked out of whack on a regular basis, even with the radio off. Other features include a dual-rate adjustment, 10-model memory, programmable buttons, and adjustable steering tension. For a box-stock AM controller, you’ll find this radio is loaded with features. From previous experiences with this radio, I’ve found that the menu system is very easily navigated through as well. The GST doesn’t have an extensive list of tasks that are necessary to prepare it for action. However, there are a few items that you’ll find necessary. So I started by readying the receiver’s antenna. First slide the antenna wire through the supplied tube. In my case, the wire slid in easily, and without any effort. However, if you should encounter difficulty, a little baby powder sprinkled on the wire will help you get it through. Once the antenna is pushed through the tube, install the tube in its resting place on the receiver box. 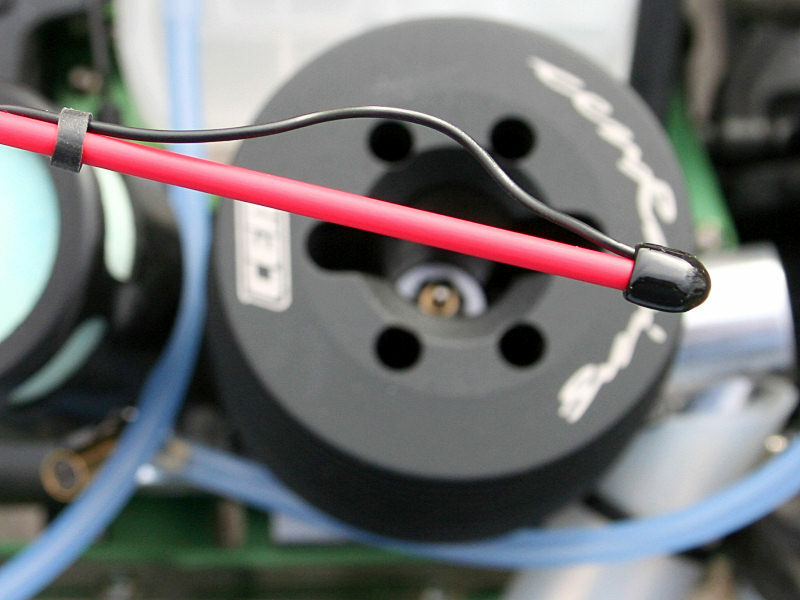 Use the supplied rubber cap to secure the wire at the top of the antenna tube. I used a rubber antenna collar from a Dubro antenna cap set (part #2342) to secure the excess wire to the outside of the tube. Next, I tackled installing the receiver pack. 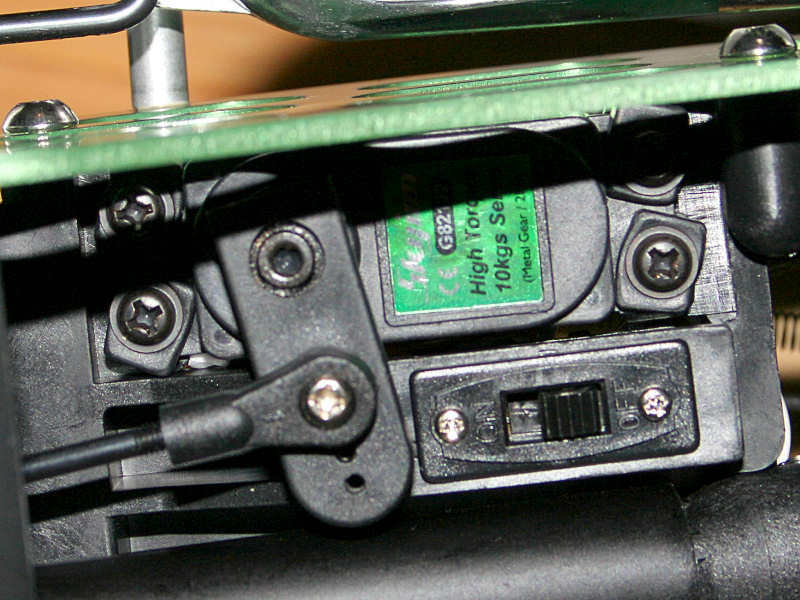 A single clip needs to be removed to open the battery box, exposing the battery holder. I removed the battery holder, and installed a Venom 5-cell receiver pack instead. I don’t recommend using standard alkaline batteries with the Genesis platform. While other trucks may squeak by with alkaline batteries the large tires, and hefty weight, of this truck really calls for a good receiver pack. Otherwise, the servos may not operate at peak performance. In addition, this will save you money in the long run, providing a more efficient power source than alkaline batteries. 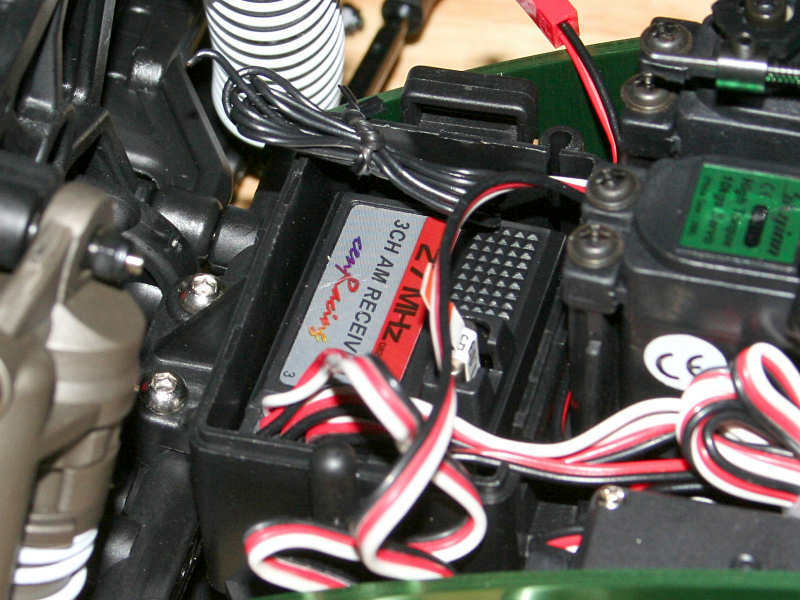 Following that I took this time to install AA batteries into the Skyion radio to power it as well. 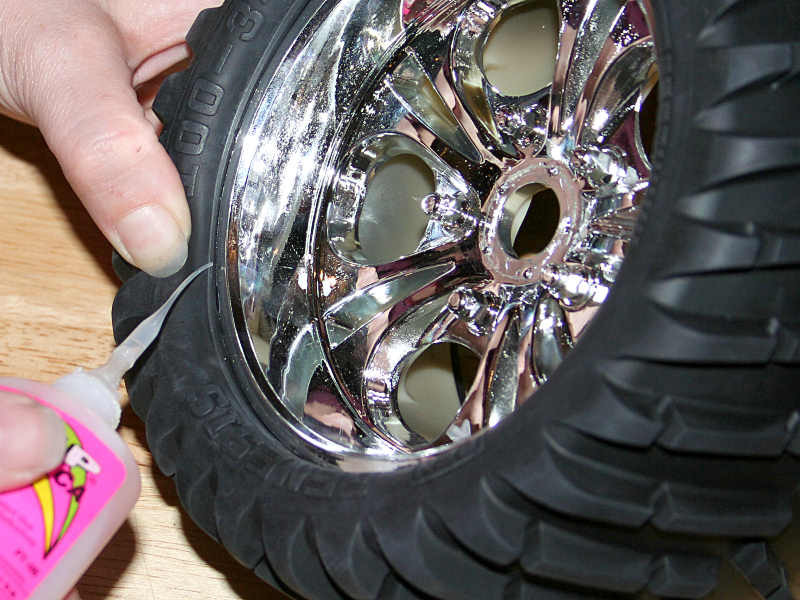 As in the case of most RTR vehicles, the GST’s tires are pre-glued. However, I still like to run another bead around the tire to help make sure it’s well sealed to the wheel. For this task, I enlisted the help of a few products from Frank Tiano Enterprises. 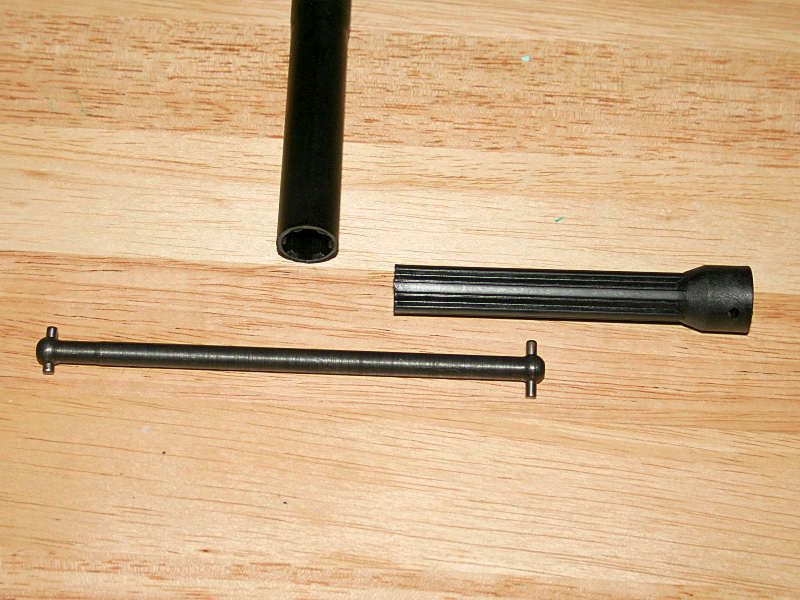 First and foremost was the super-thin Zap CA glue, which I applied using one of their micro tubing ends. The applicator ends are sold separately, in a container that holds a large assortment in various sizes. They really do the trick though when it comes to a trouble-free gluing process, unless you really enjoy gluing your fingers together. Of course, if you still want to play it really safe, enlist the help of your wife as an assistant! If you’re looking for quick results, as I often am, a bottle of Zip Kicker will also come in very handy. CA glue dries fairly fast, but Kicker is an accelerator that speeds the curing time up to nearly instantaneous. You simply spray it on the CA glue, and it cures it on the spot. The result is a strong hold that doesn’t require you to hold the tire in place while curing. It also eliminates the need for the tire rings which some people use to hold the tires securely against the rims during the CA glue’s curing process. Even though the stock tank provides filtering capabilities, I normally opt to add an inline filter to the fuel delivery system as an extra layer of protection. So I grabbed a Dubro Fuel Filter (part #2305), and cut the fuel line. I then slid the fuel filter into the gap, knowing that debris getting into the engine should no longer be a possibility. To facilitate easy refueling, I used a ziptie and a small section of Dubro fuel tubing. The end result is a nice little handle for the fuel tank that makes opening the lid extremely easy with the body installed. 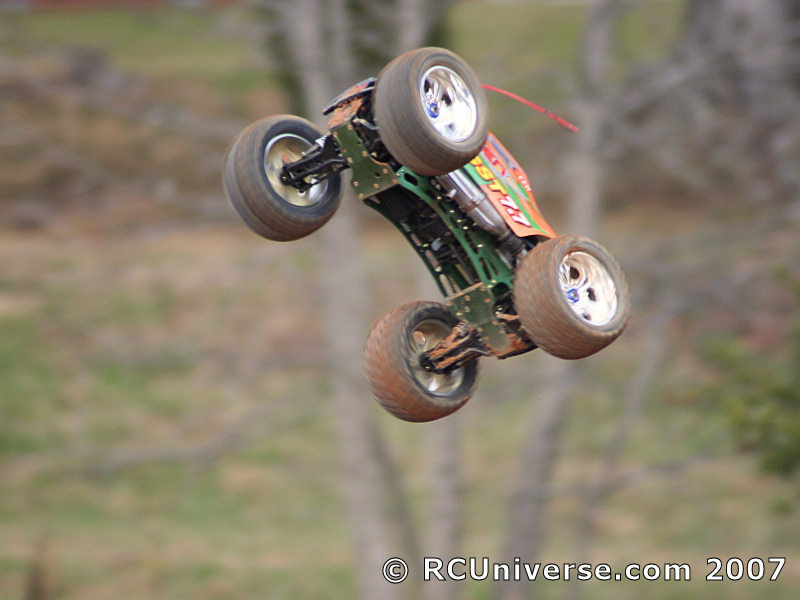 This is an old racer’s trick, but works well for anyone running a nitro-powered truck. 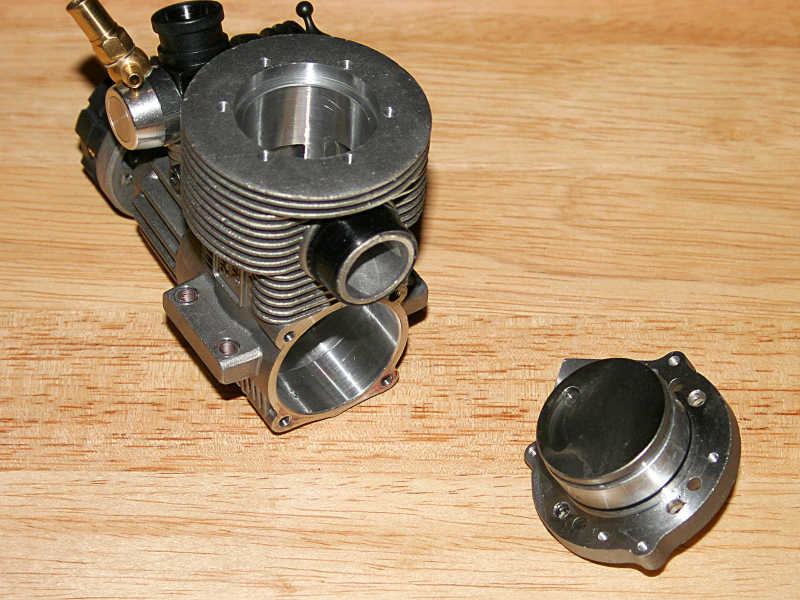 The engine will need some air flowing across the head of the motor to keep it cool. Normally I enlist the help of a hole saw for this task, but my cordless drill was on the fritz when working with the GST 7.7. So I used my lexan scissors and a Dremel to cut a cooling hole in the windshield for provide proper airflow. CEN covers the basics when it comes to the body post and cooling holes, but I also wanted to install a set of Dubro Klip retainers. I’m hooked on the usefulness of these items, as not only do they prevent lost clips, but they are also very handy for keeping the clips attached to the body when you’re working on the truck. I used my body hole reamer to make a couple of small holes for the Klip Retainers, and then installed a pair of yellow ones onto the front and rear of the Havoc. I also enlarged the antenna hole on the body with the reamer, as the existing hole wasn’t big enough to accommodate the included antenna tube’s cap. With the body readied, all that was left was for me to install it onto the chassis. Just like with any nitro-powered truck I started with a proper break-in routine. I did opt to use the heat cycle method instead of the idling procedure mentioned in the manual. I would recommend one being comfortable with understanding the differences of a slightly rich and lean motor to use this procedure however. If you’re new to the nitro game, stick with the procedure in the manual. It’ll prove itself to be much easier and straightforward for the novice. The CEN .46 fired up easily once the engine was primed, but be prepared to feel as if you’ve given your arm a workout by the time you’re finished with the whole session. 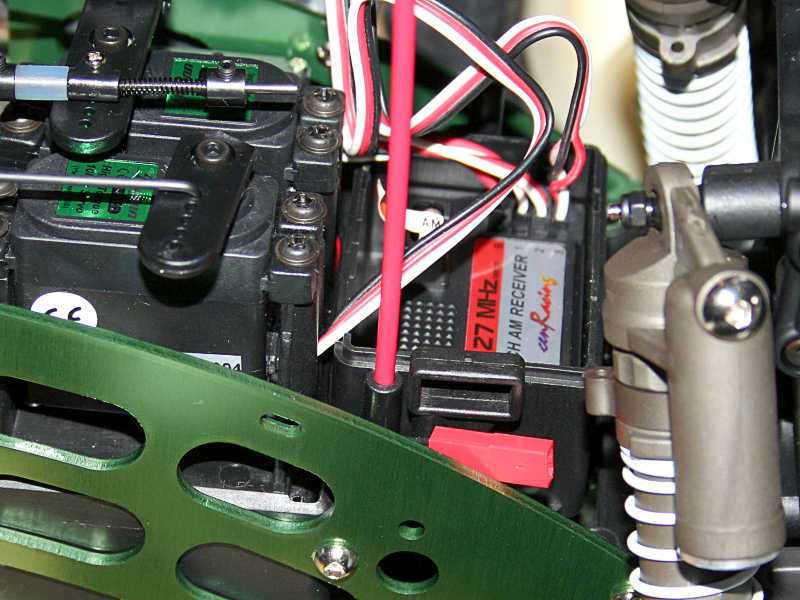 Starting the large motor when it’s new requires a little more effort than smaller powerplants require. The ambient temperatures were pleasant for me that afternoon, with an uncharacteristic high of around 66° and sunny for a weekend in December. On a cooler day heating the engine with a hair dryer beforehand will help make the engine easier to turn over. While I never ran into any problems with other CEN Genesis vehicles, it was also nice to know that the pullstart has been beefed up to account for the large motor. The break-in procedure went smoothly with only minor adjustments needed to the needles early on. 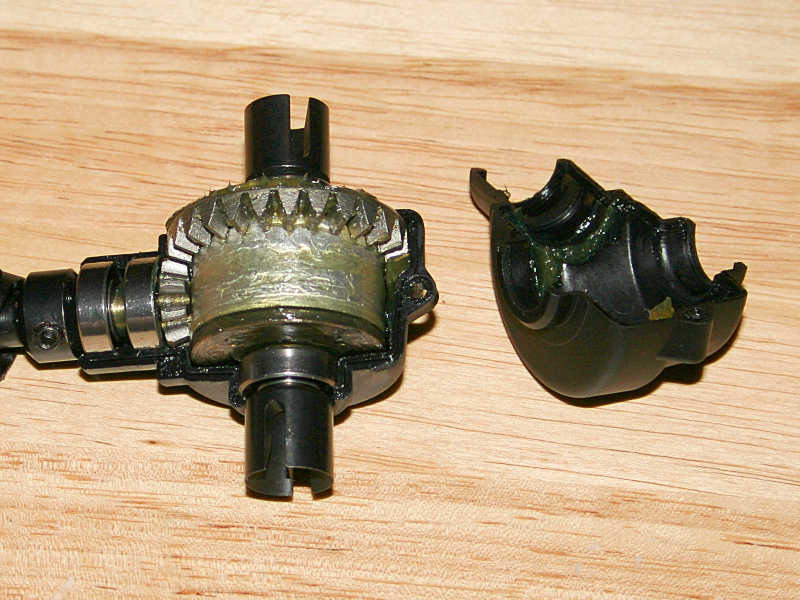 While taking it easy during the break-in, I could easily see the shift from first to second gears. First gear didn’t last long, even at the slower pace I was using. It really only served the purpose of getting the truck moving with plenty of low-end torque still available. A few feet later, second gear would take over. During the break-in process though, I didn’t get moving fast enough to see third gear coming into play. Later on though, third gear would be effective in carrying the 17 pound truck to speeds of around 45MPH. Soon I had the break-in procedure behind me and began to tweak the needles to give the truck an emphasis on performance. With the large fuel tank on the GST though, it’s really important to adjust the engine’s needles when it’s half full and warmed up, as larger tanks can affect the engine’s running conditions and tune. The Genesis has always been a brute of a truck, but it really seemed like the GST felt a little stronger than I remember. While the top speeds of the truck fall within the same range as other monster trucks, the .46 engine also provides a ton of raw low-end torque to get the big truck moving in a hurry. So don’t fall into the trap of thinking that big equates to slow, because the GST can get out of the hole in a hurry. 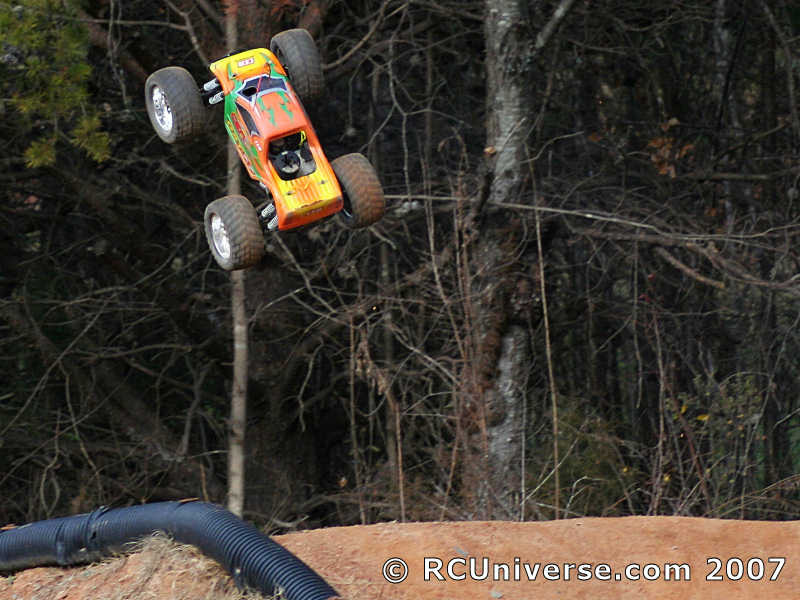 Once the engine was broken in and the tune dialed in I took the truck to Monkey Bottom Raceway, with the intention of testing it out on the large dirt track and jumps. 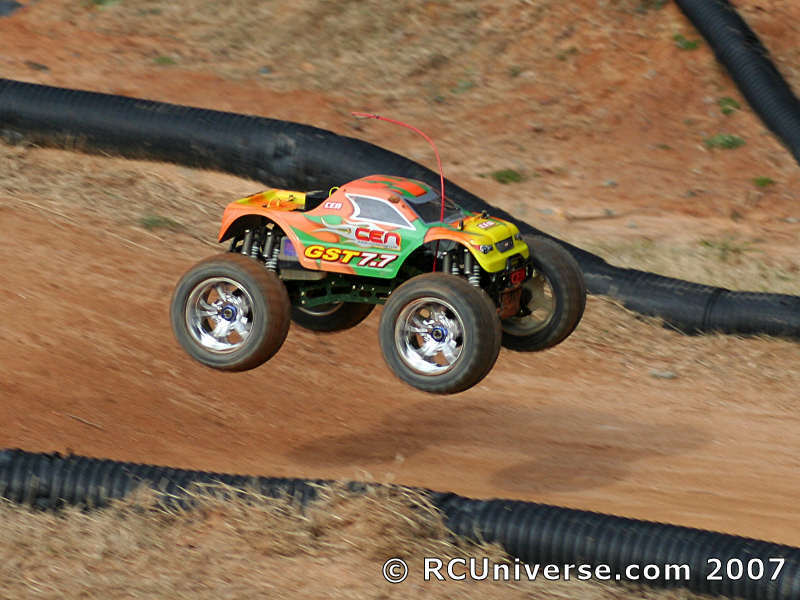 A truck like the GST 7.7 is built to jump, and the various areas on the track would definitely put it to the test! However soon after getting the GST on the track, fate dealt me a cruel hand. As I was warming the truck up one of the rear differentials output yokes snapped, leaving me with a truck that could barely even move itself on the track. Knowing that I hadn’t even begun to drive it hard yet, I chalked this up to a flawed part from the factory. Stress definitely wasn’t an issue considering the circumstances. I was left with no choice but to pack it up and head back home. I contacted CEN, and within a couple of days I had a replacement part ready for installation in the truck. 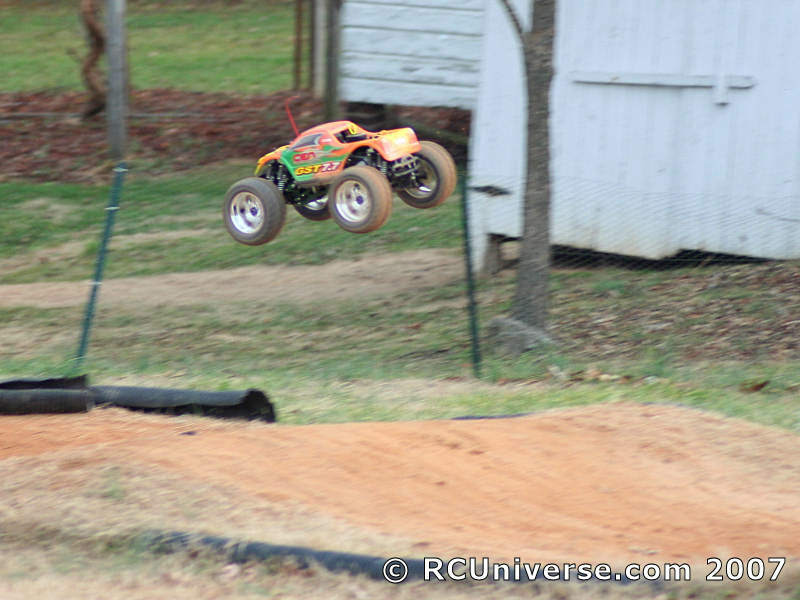 With the truck repaired I headed back out to the track anxious for a chance to really put the GST through the wringer. After a few pulls of the pullstart I had the GST fired up and running, much to the disbelief of several people at the track who thought I might need to warm the engine up to get it started due to the cooler weather. 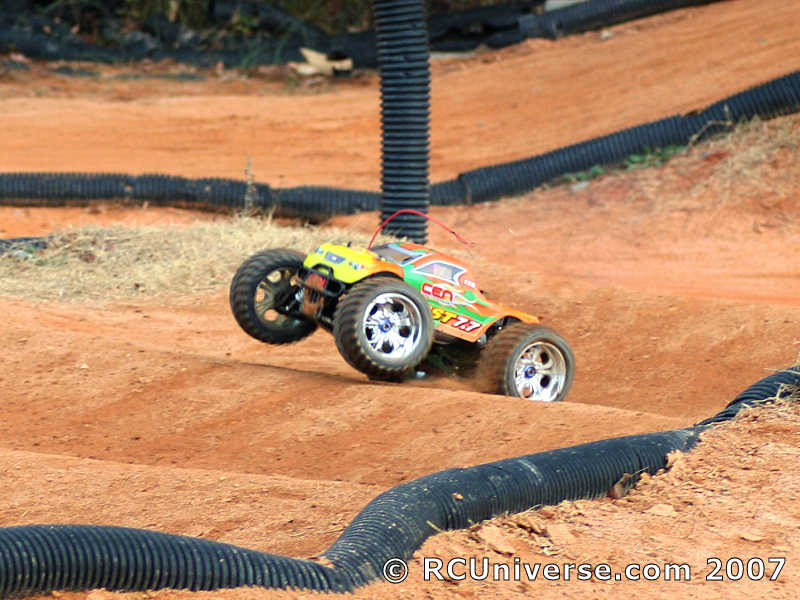 I then headed to the driver’s stand, goosed the gas and the GST pulled out onto the track. The first thing that I noticed was that the idle speed wanted to stay a little too high causing me a little problem when jumping the truck. Due to the fact I had been driving the truck a little easier prior to this I hadn’t noticed this issue yet. The brakes seemed to be slightly out of whack as well, with the front brakes having a tendency to do the majority of the work. In fact, if I wasn’t careful, the front brakes would clamp so tight that the GST would flip completely over on its lid when they were applied. These minor items needed to be addressed, so I pulled the GST 7.7 back into the pits. The idle issue was fixed easily enough. I loosened up the linkage collar so there wasn’t any preload on the linkage with the radio at an idle setting, as this had been holding the carburetor open slightly. To adjust the brakes, I simply backed the collar back, away from the braking lever. Then I compared the braking strength of the front and rear brakes by holding the appropriate end of the truck up while applying the brakes. I found that simply backing off of the front brakes was enough, as once that change was made the servo had enough travel to engage the rear brakes nicely. 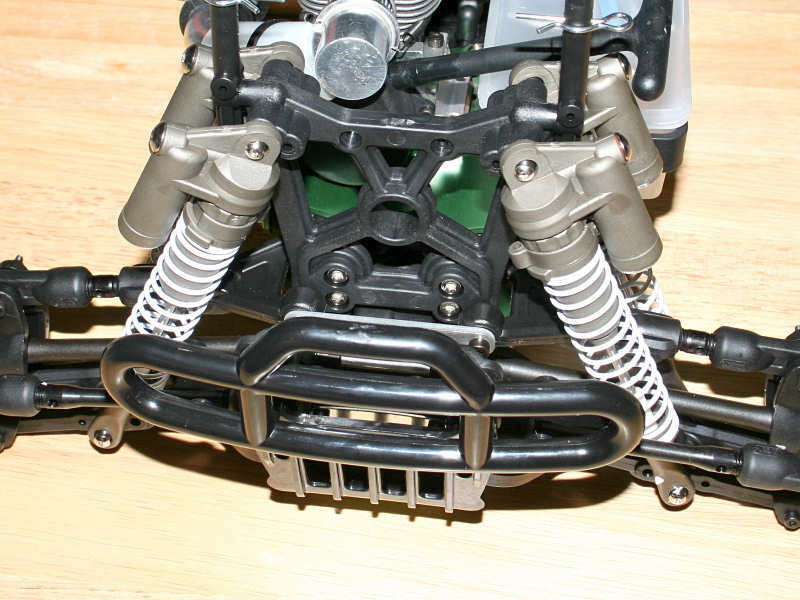 I also moved the steering linkage farther out on the servo horn to increase the steering travel of the front tires. As a final adjustment I popped out the stock preload spacers that were installed, in an effort to keep the truck’s center of gravity nice and low for running through the corners. Back out on the track I found that the braking adjustments worked much more in the truck’s favor. Before the truck came to a near complete stop when the brakes were applied, preventing you fron trying to brake much entering the corner. With the rear brakes performing most of the work after my changes, the back end of the GST could be induced into kicking out and then pivoting entering the corner. 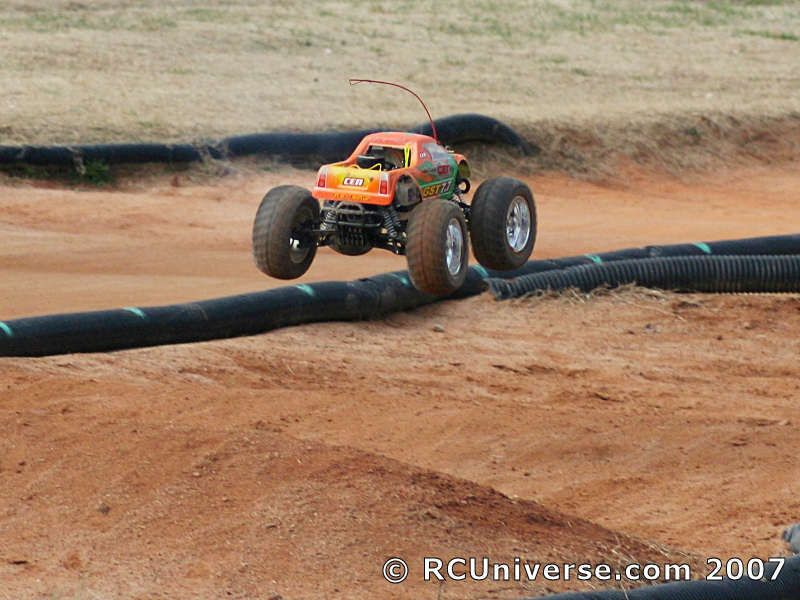 The truck still felt big and as if it took up a large portion of the track, but before the brake adjustment getting it around the track had seemed near impossible. The GST certainly had plenty of power in between the turns. With the brakes adjusted I pushed the truck a little harder around the track, and soon found myself laying down hard on the binders after a spirited run between exiting one and entering another. 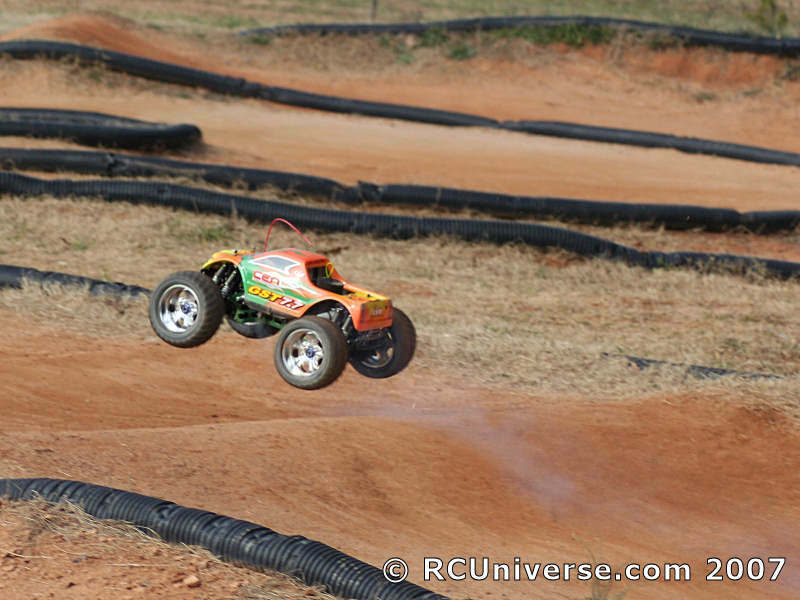 I always felt that my local track was enough track for about any vehicle I’ve tested. 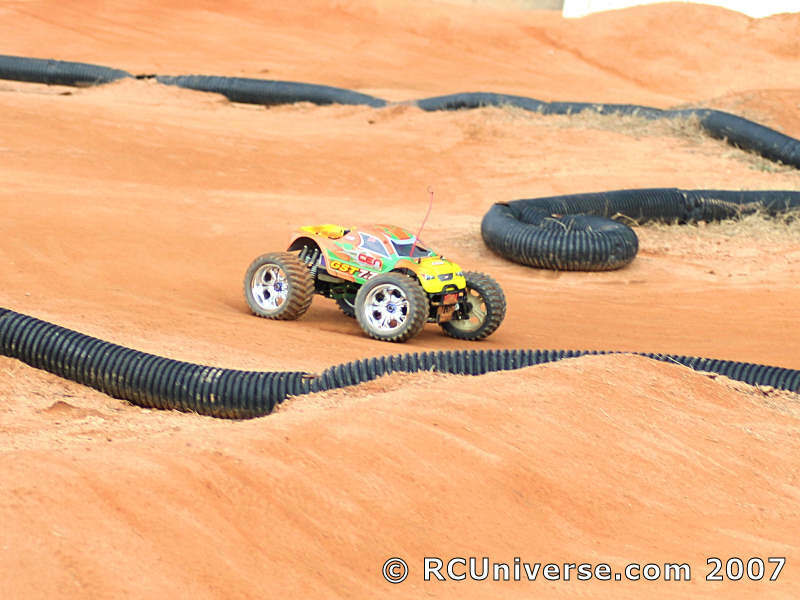 However, the GST managed to make the track seem small and confined with its low-end power and overall size. The GST 7.7 is a big truck, and definitely requires a suitable space upon which to run. 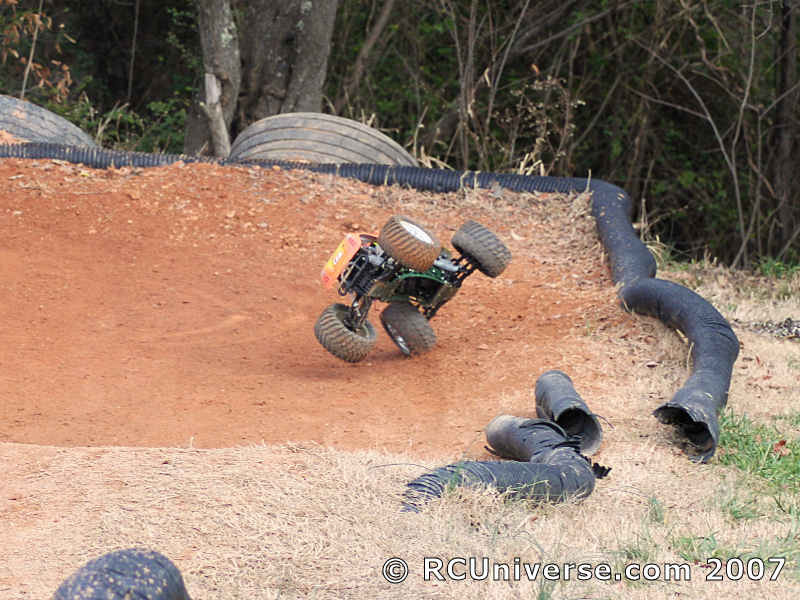 Coming out of the corners the front wheels seemed to try and grip a little harder than the rear. The end result was the front end of the truck unloading, which would expand the front tires. It wasn’t as extreme as I’ve seen before with some vehicles, but it was present. There would be two ways to prevent this. 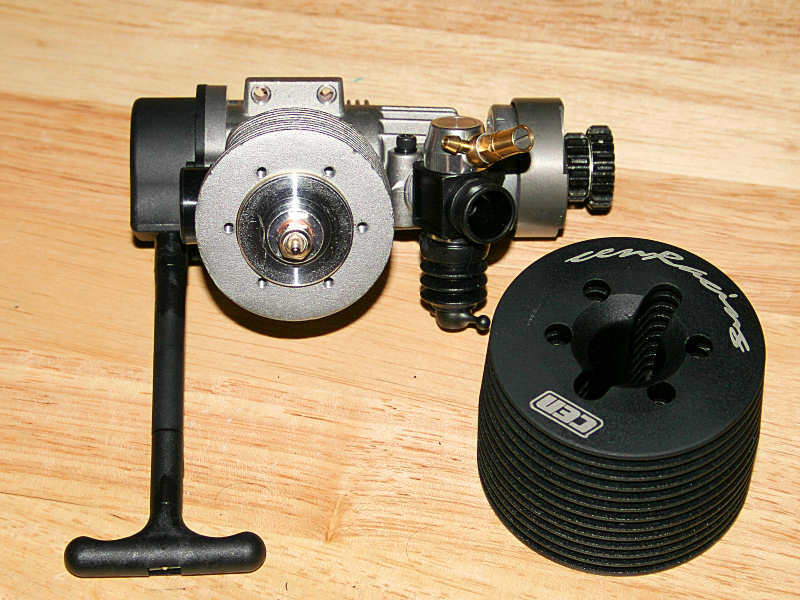 One would be to use the center differential lock set included with the GST. However, even for bashing I think that’s mostly counter-productive. A truck with a center differential tends to stay under control with less effort, if it’s set up well. So I’d look at playing the weight of the center differential oil. In addition the differential wasn’t even topped off as described in the manual. I’d say a silicone oil weight of around 20,000 would be a good place to start, and then go up or down as desired. 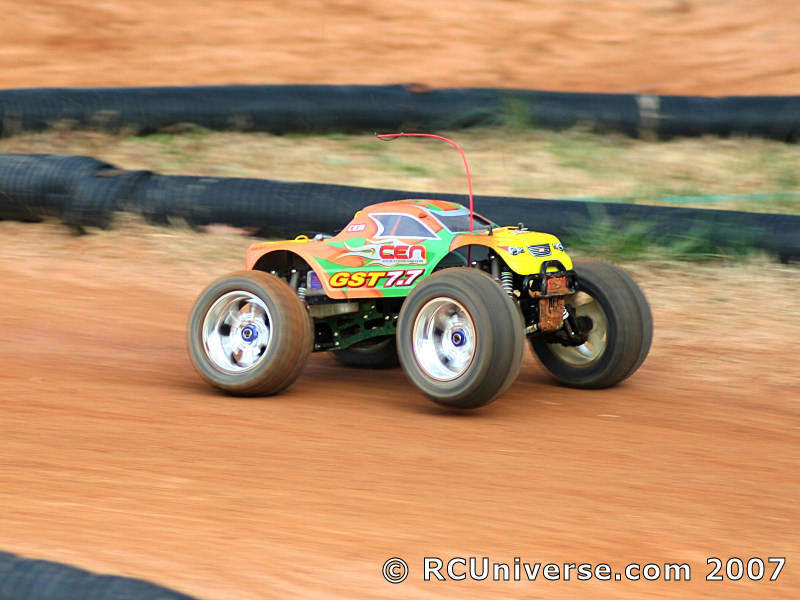 The CEN GST 7.7 made some good runs towards the jumps at the track. Given the Chevron patterned tires this was surprising, as they really aren’t optimal for grip at the track as would be a more pin-based tread pattern would be. 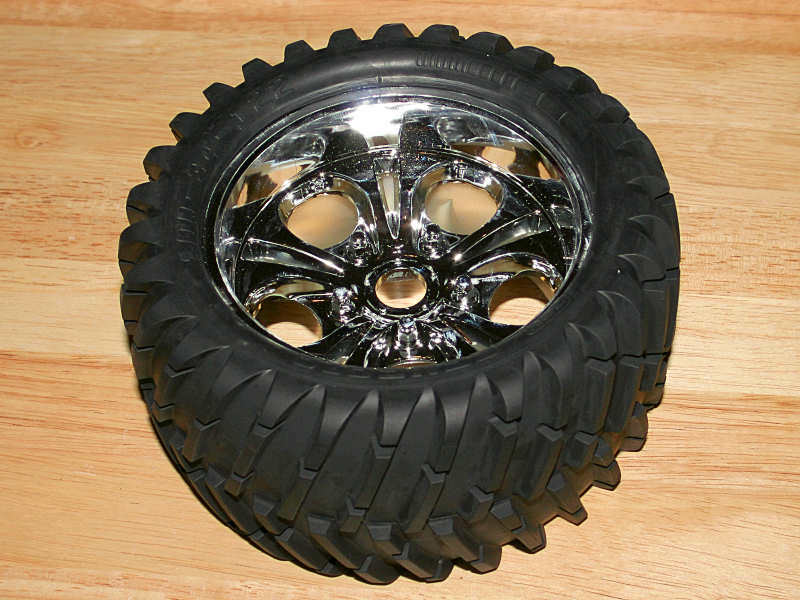 The tire does suit the vehicle’s intended audience however, which is the basher. The average tread life should be good, as well as the tire providing decent traction across about any surface. In short, the GST’s tires are a more universal tire suited to tackle the terrain found in the backyard where it will more often be run. The GST could clear the doubles at the track with ease. Longer and stronger jumps weren’t really a problem for the truck when it come to raw power, but the GST did rebound pretty roughly sometimes over the larger jumps. This indicated a need for a little more dampening action. A slightly thicker shock oil weight would help eliminate what I saw, although it would change the truck’s handling through the rhythm section. It took the rhythm section nicely, thanks to the softer rebounding action of the shocks. 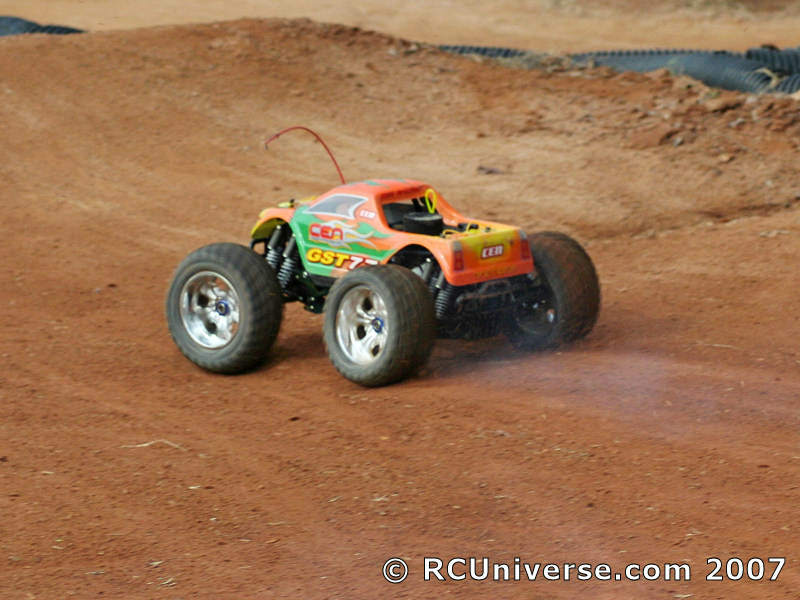 Thicker oil would slow the shock’s action down in this regard, making it react slower to the terrain changes in the rhythm section. The difference with a vehicle of the GST’s size would likely be noticeable. I imagine though, given the GST’s target audience, that they would opt for a little more dampening for the jumps, as technical track sections aren’t going to be as important in most cases. Despite the rebounding characteristics I saw, I still liked the way the truck handled much better than it had before with the two horizontal shocks. The truck had a little bit more low end shock action and seemed to like running over the rough terrain much better than it did before. In fact on several occasions it overshot a corner while jumping and would end up in the rough areas along the fringe of the track. The GST 7.7 cut right through any underbrush and track materials, hopping right over the track barrier to continue on it’s way. This second session with the truck further confirmed my feelings that the differential output yoke break I had experienced earlier was merely a freak break. Throughout the afternoon the truck was pounded over jumps, tumbled end over end, and sometimes landing on its top upon botching a jump. An upside down landing of around 5-6 feet for a 17 pound truck is nothing to sneeze at, especially once one takes the time to consider the sheer amount of force the truck will need to endure. In one instance the truck rolled end over end, finally coming to an abrupt stop thanks to a cement block used as reinforcement for a corner of the track. 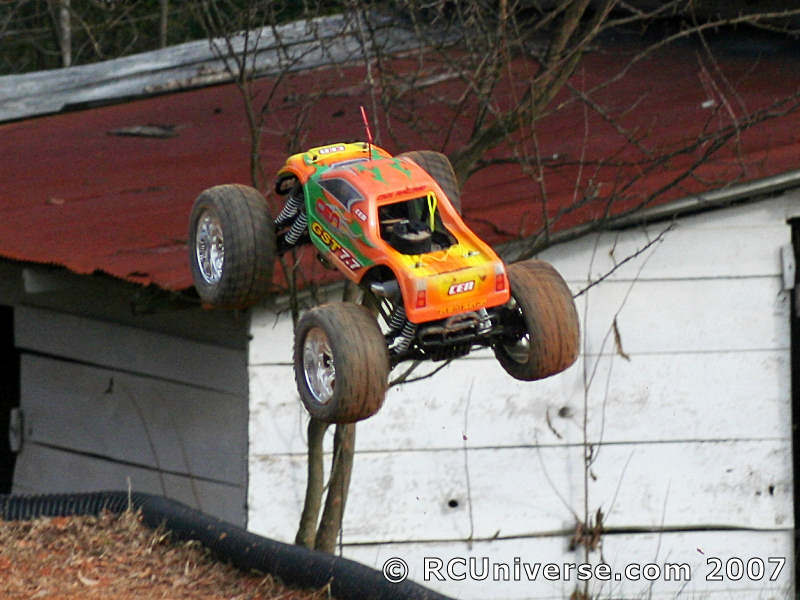 The only result was a minor dent in the rollbar, and the truck was ready to go again once it was flipped over! The CEN GST 7.7 is an example of further refinement for their Genesis platform. While a truck of this size and weight typically has a lot working against in regards to durability, the GST does surprisingly well at handling the punishment its owner will dish out. The small improvements CEN has made in an effort to update areas of the truck help round it out as well. The redesigned recoil starter will come in handy when starting the large engine, and the improvements to the motor and carburetor make the truck a little easier to tune overall. 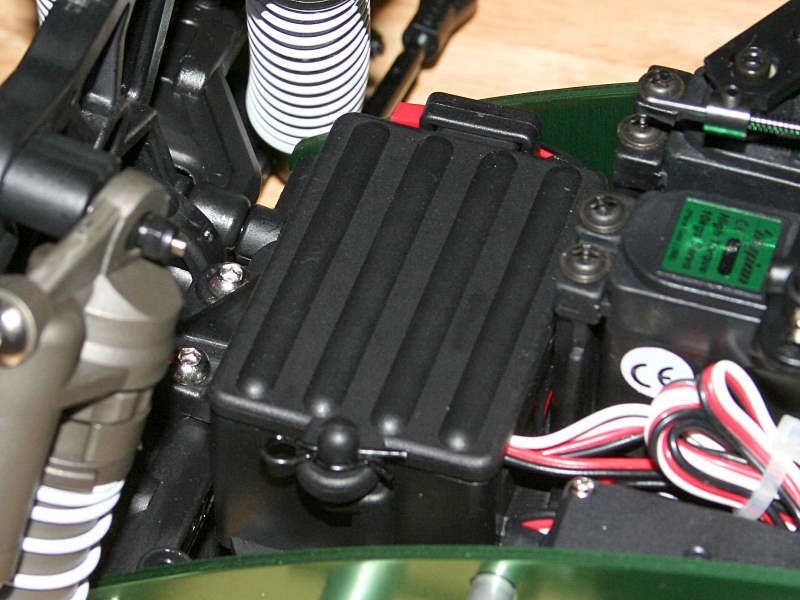 Typically I suggest an aftermarket servo, as it will help out on most vehicles. While there may be some benefit in a servo torque increase with the GST, the biggest problem seemed to lie with the spring on the servo saver. Even when tightened down it seemed a little too soft for the GST’s large tires. 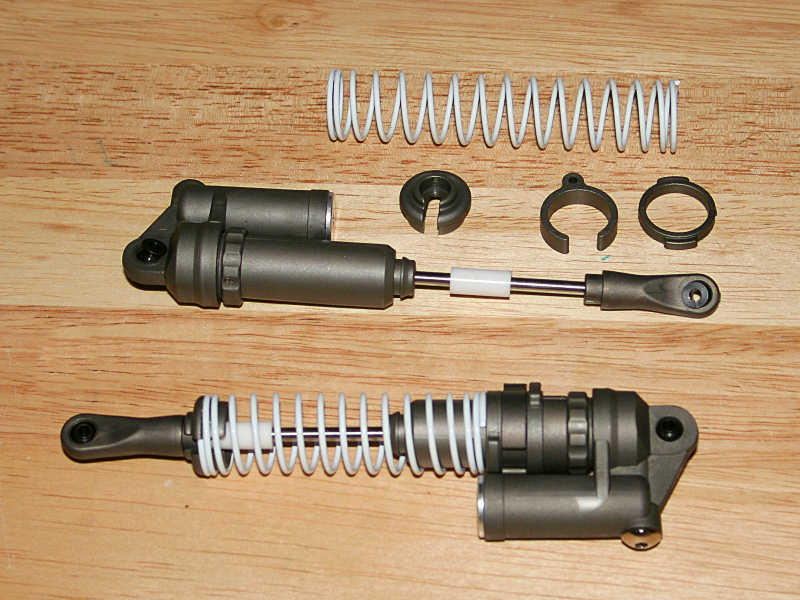 A stiffer spring would likely make the steering much more responsive overall. CEN continues to try and revise the Genesis platform, and the GST 7.7 is the best version of the truck to date. If you’re looking for a super-sized truck with the goods to back up its aggressive looks then look no further. The GST 7.7 is going to be your kind of truck.